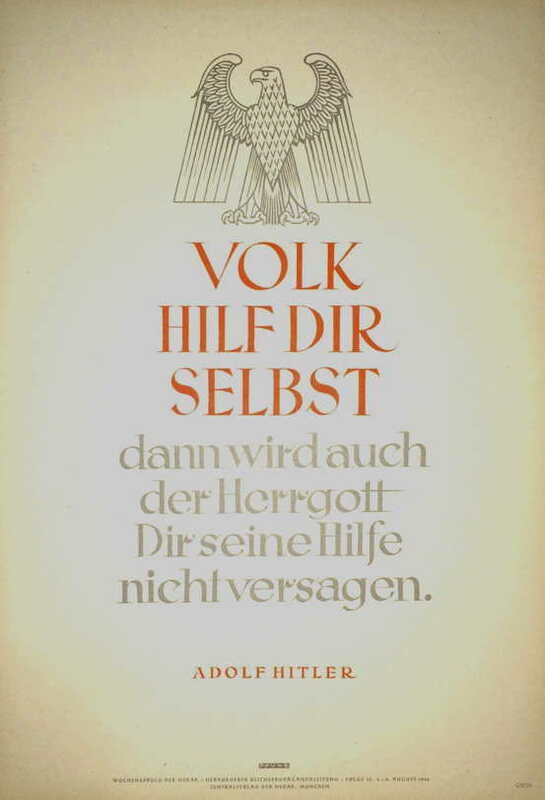 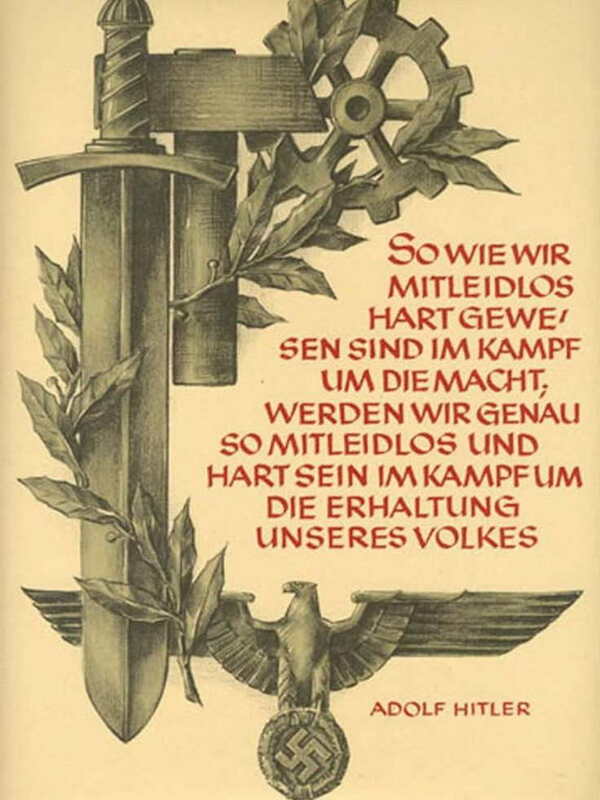 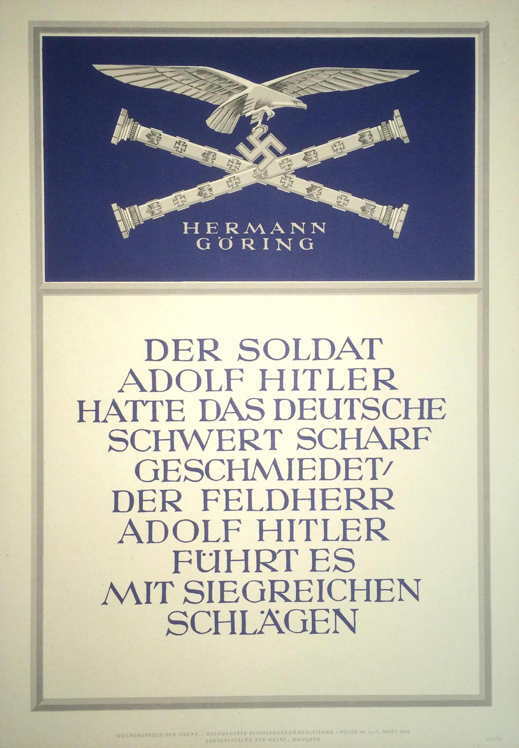 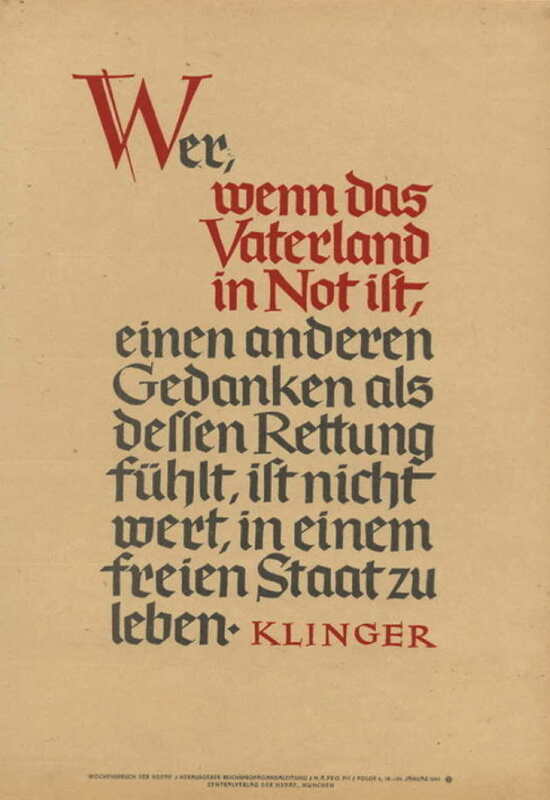 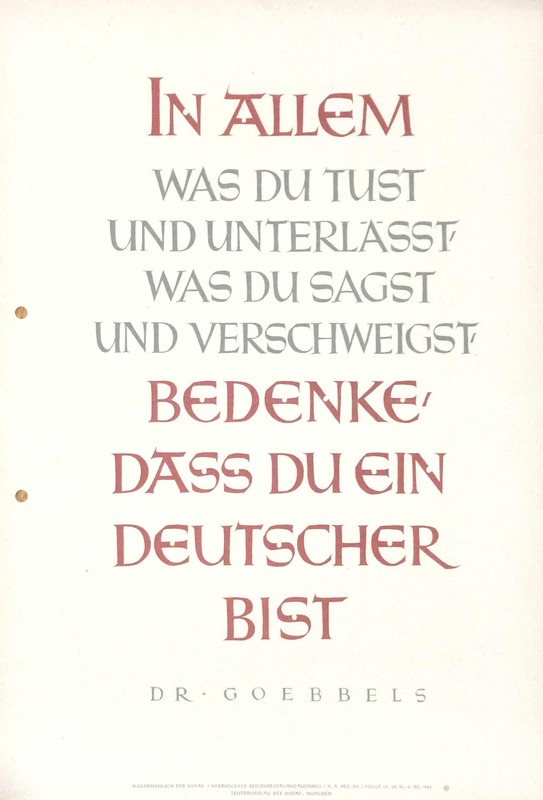 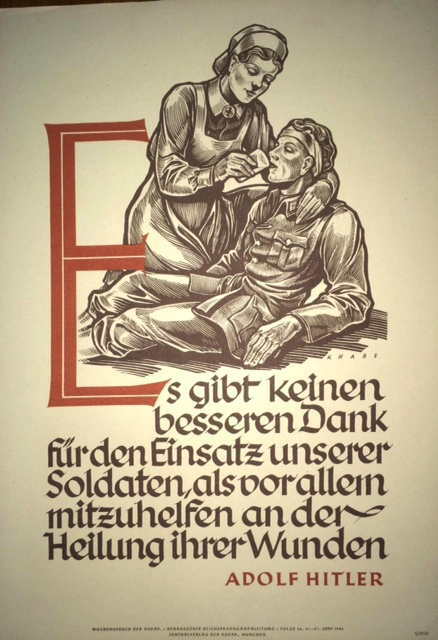 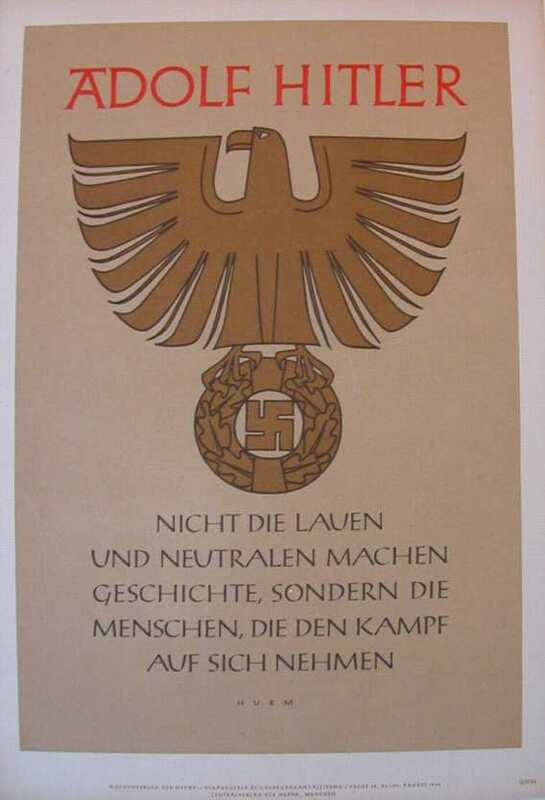 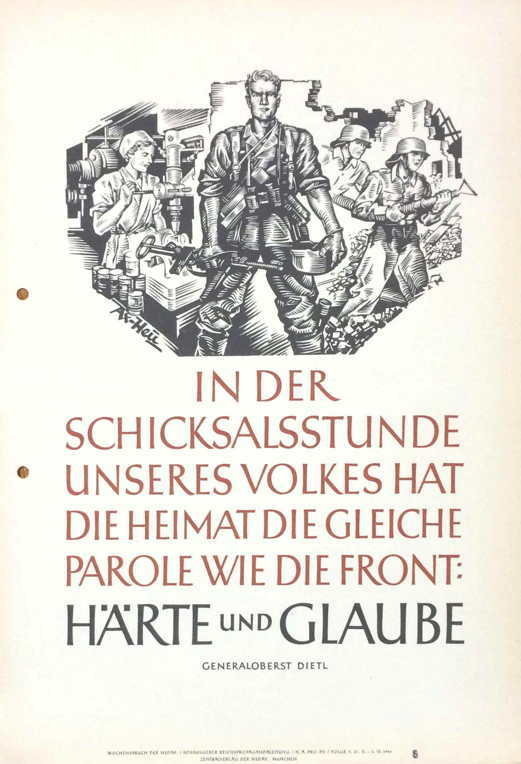 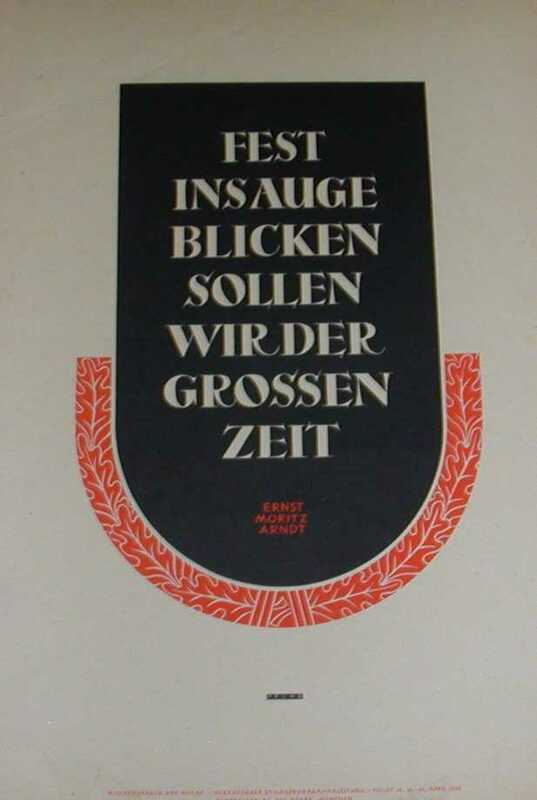 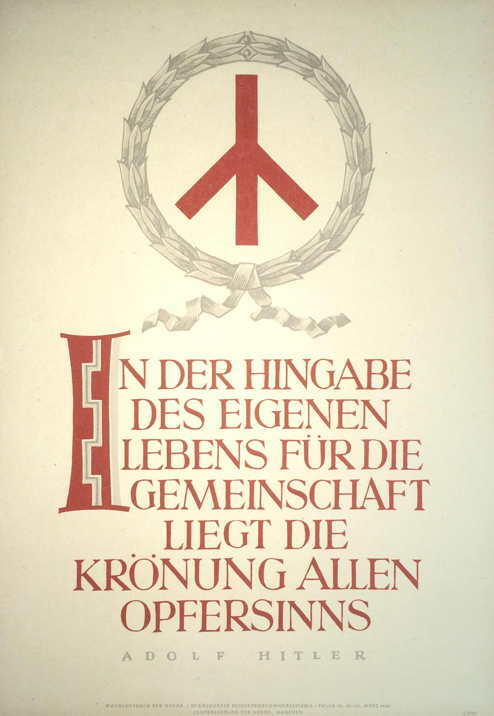 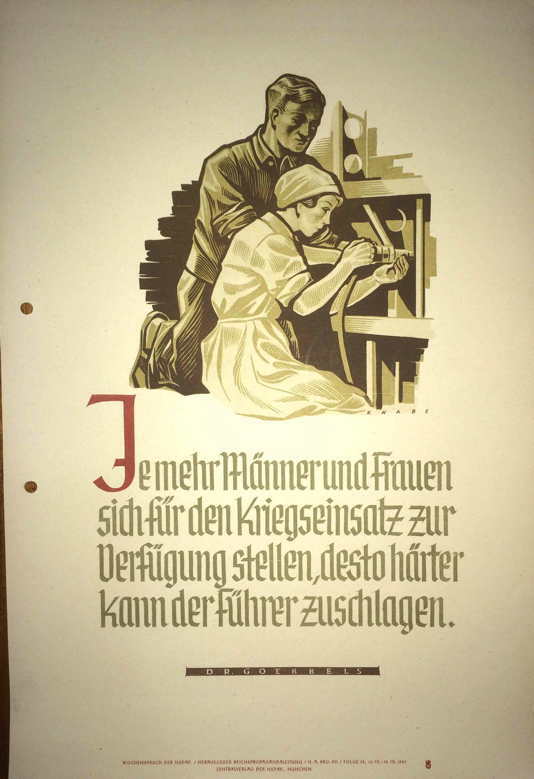 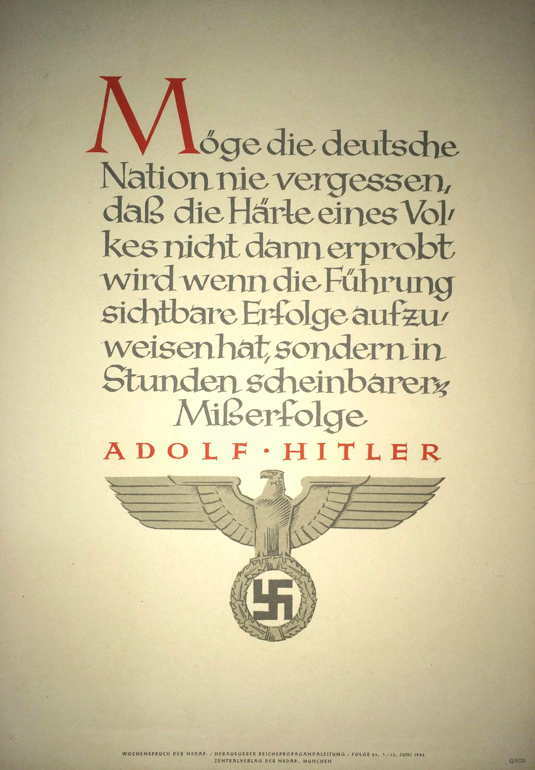 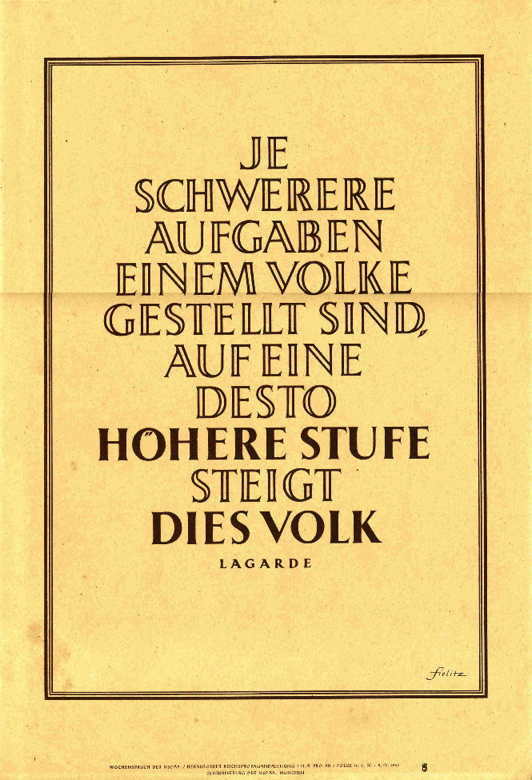 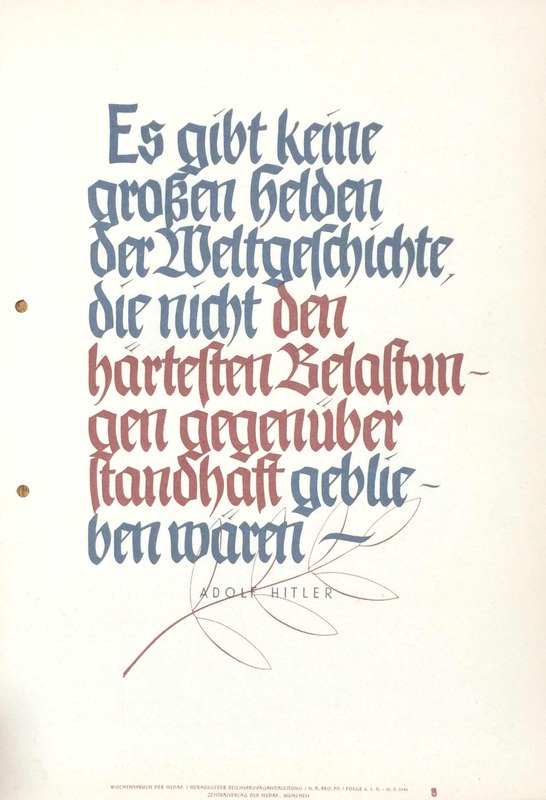 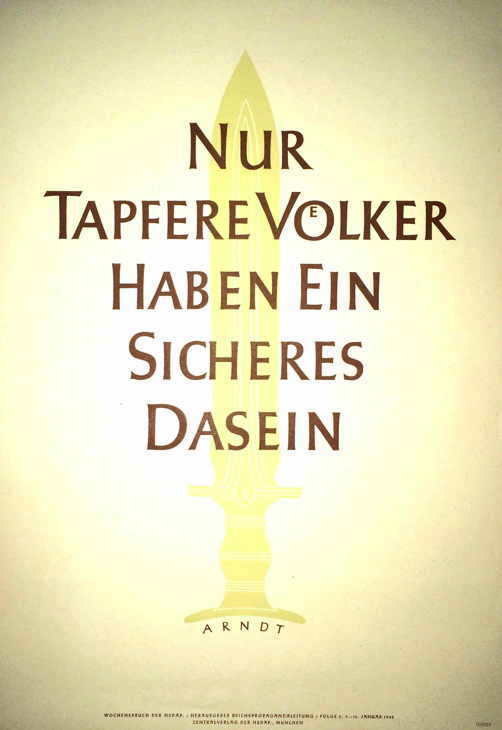 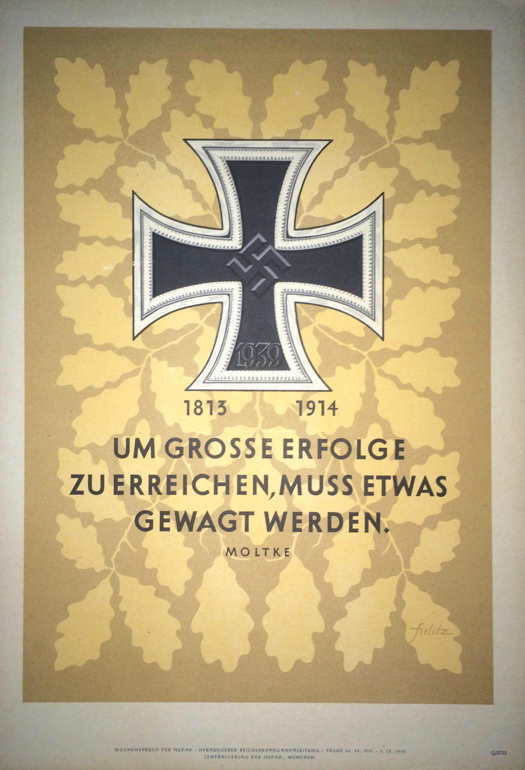 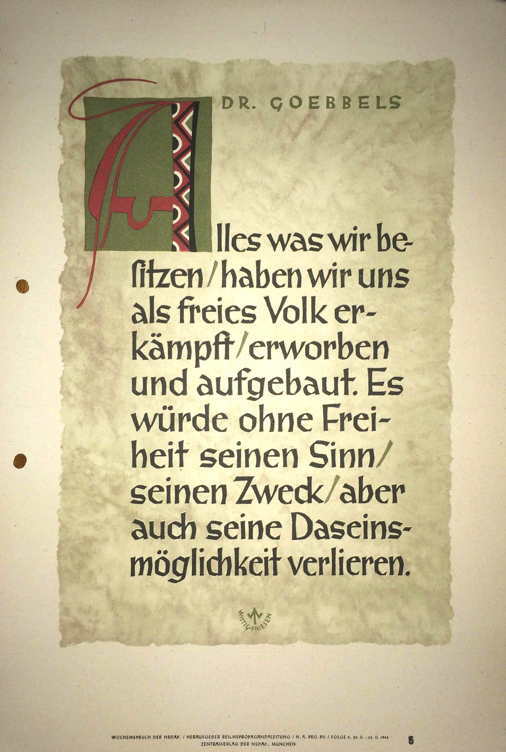 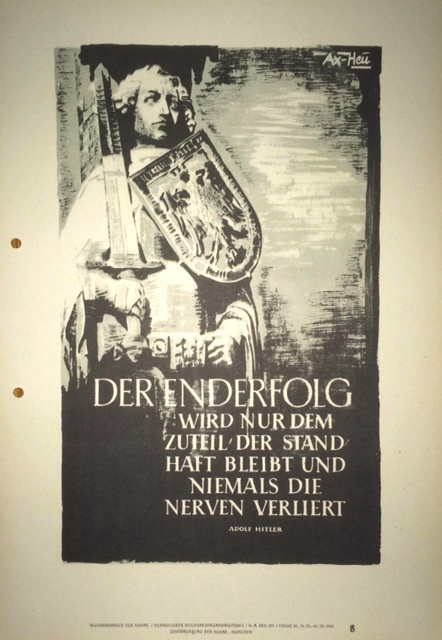 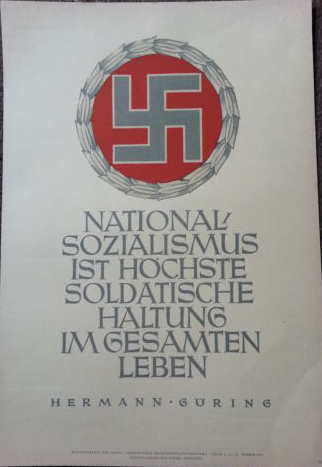 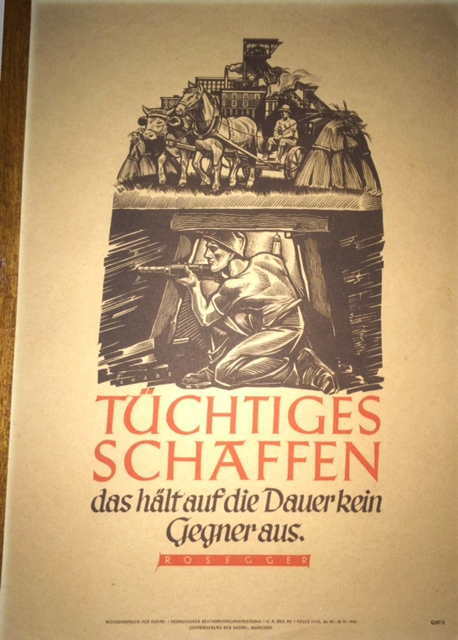 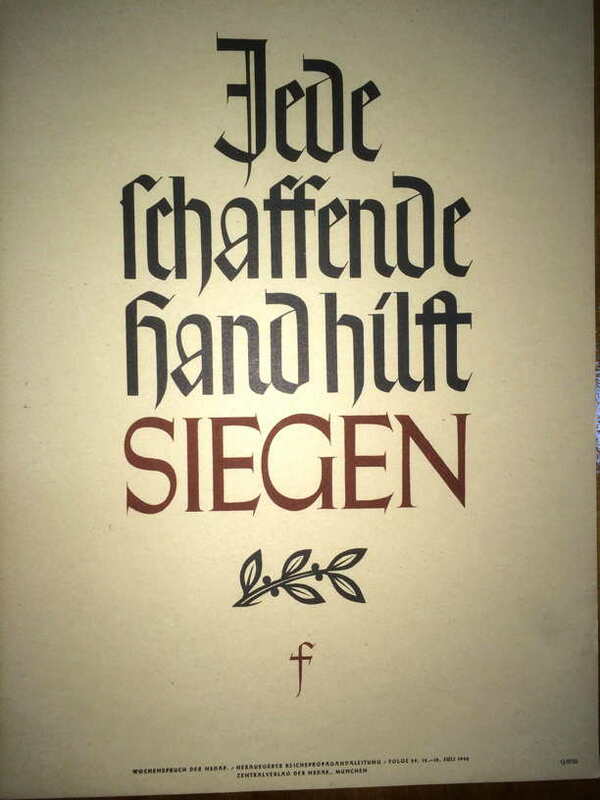 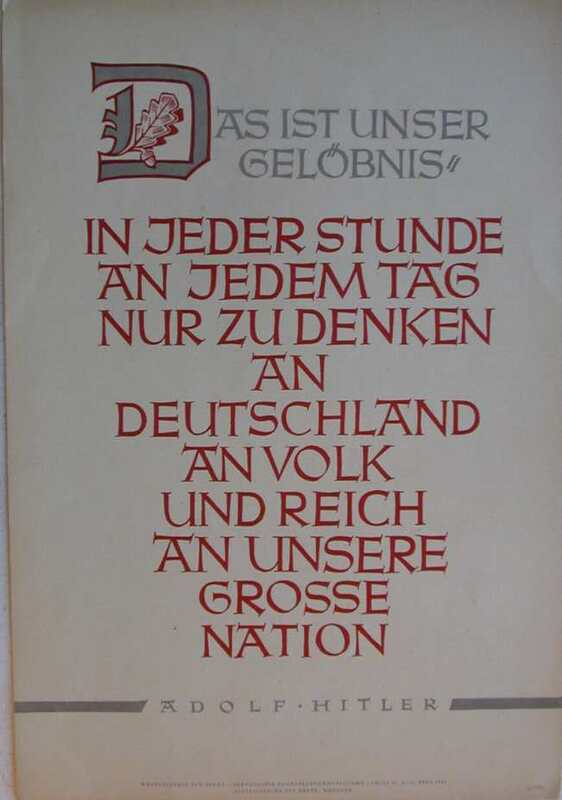 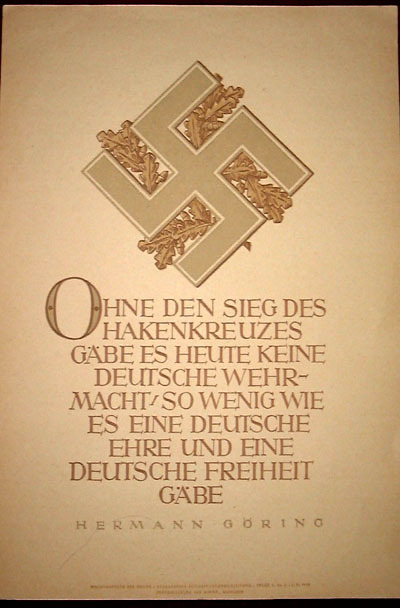 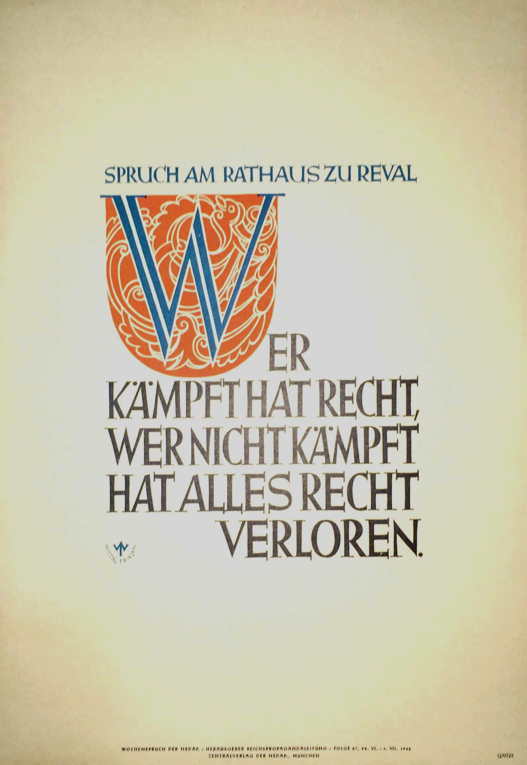 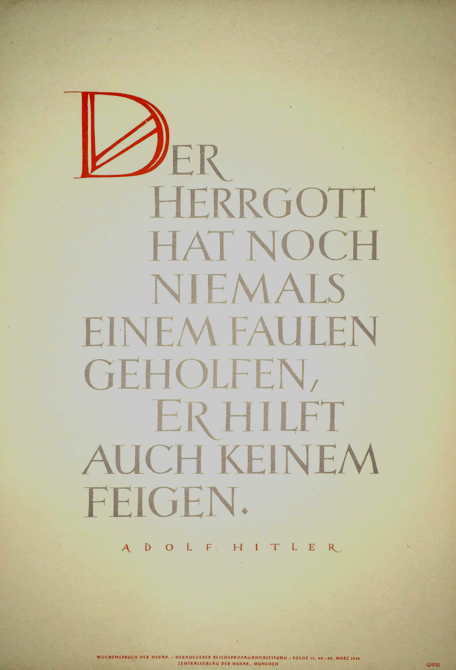 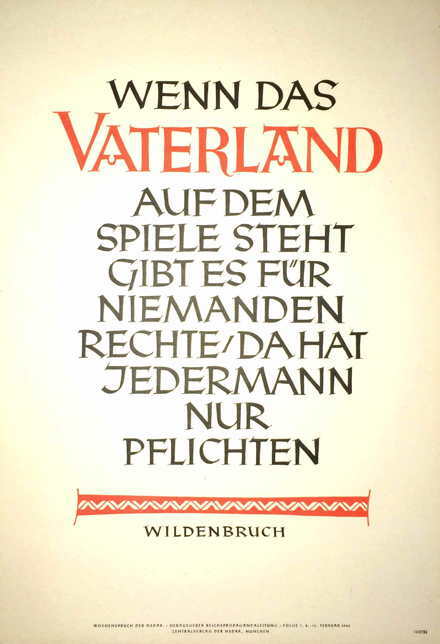 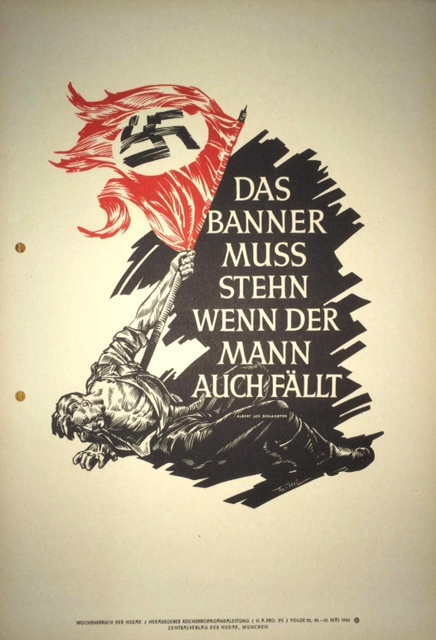 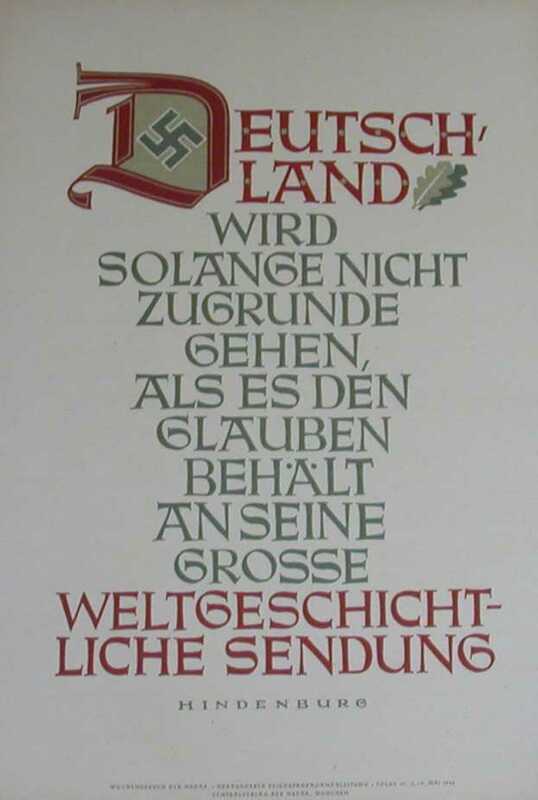 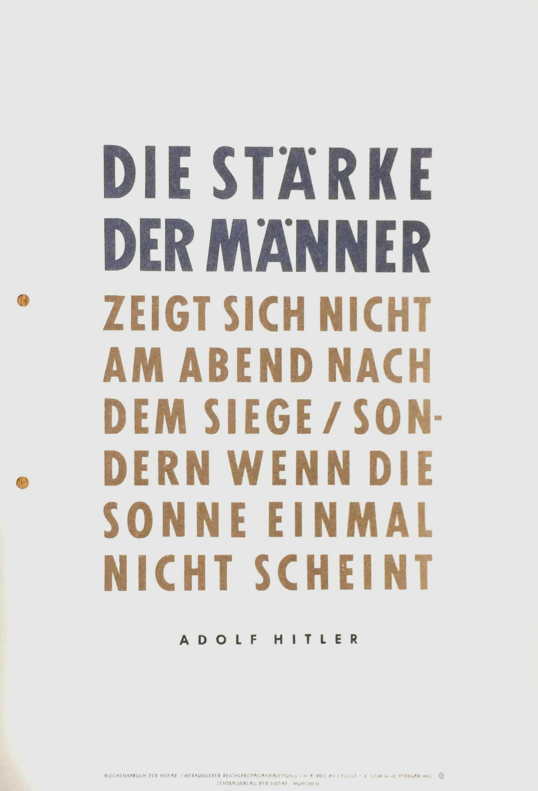 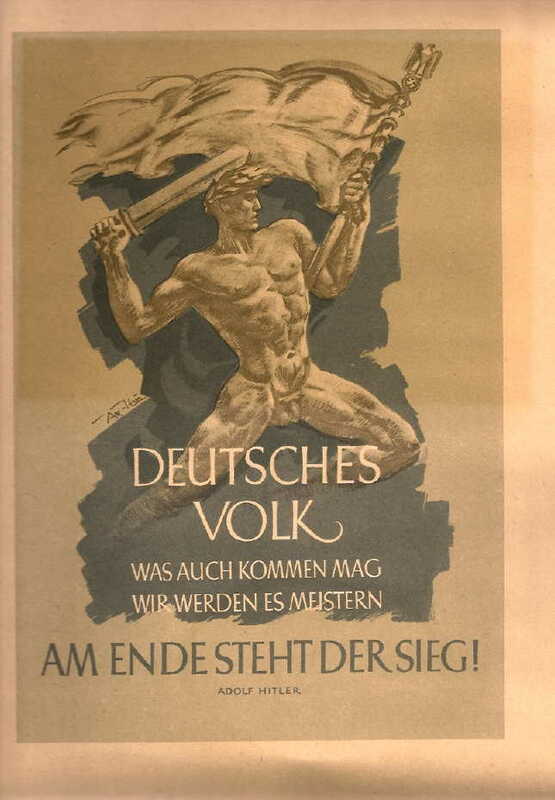 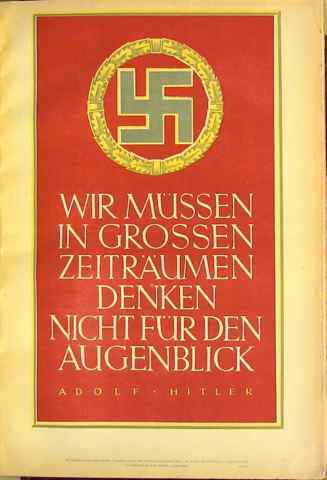 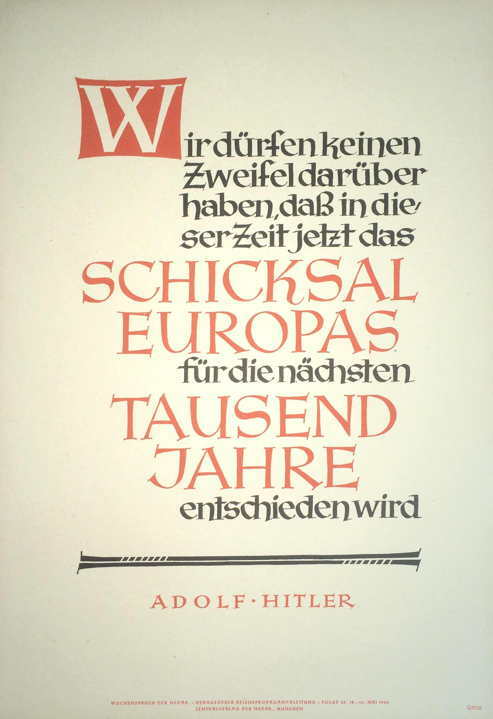 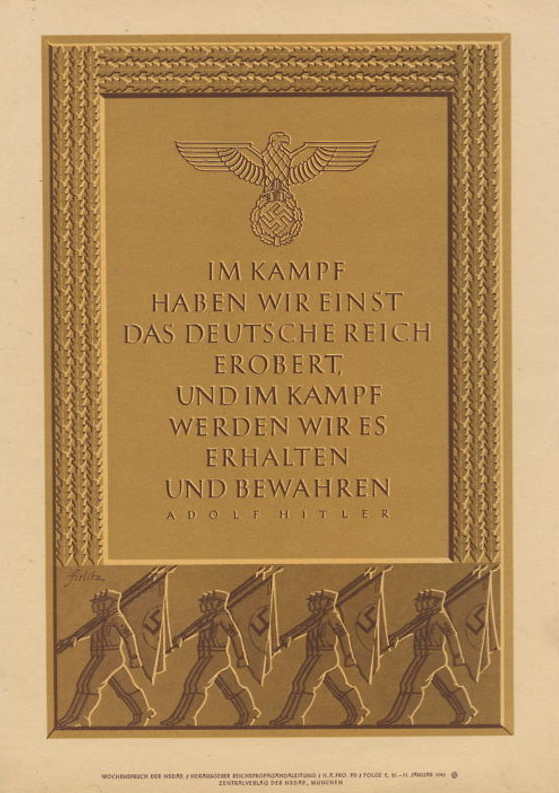 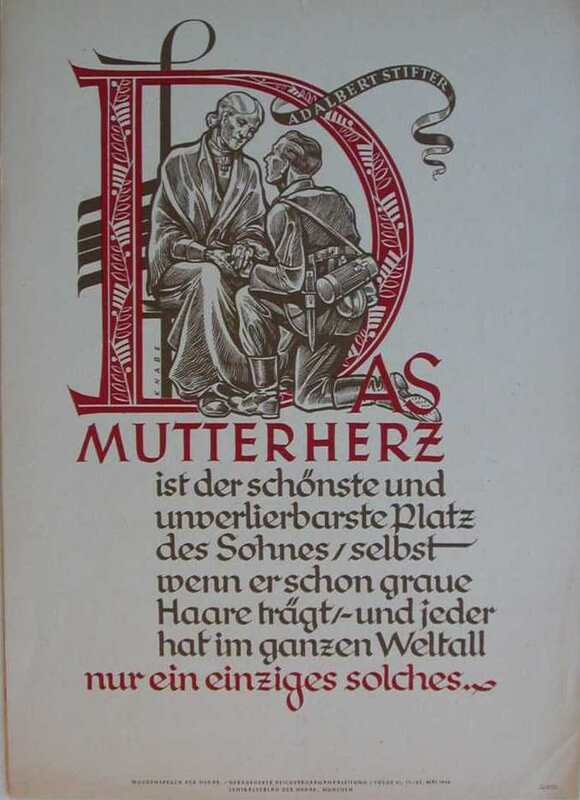 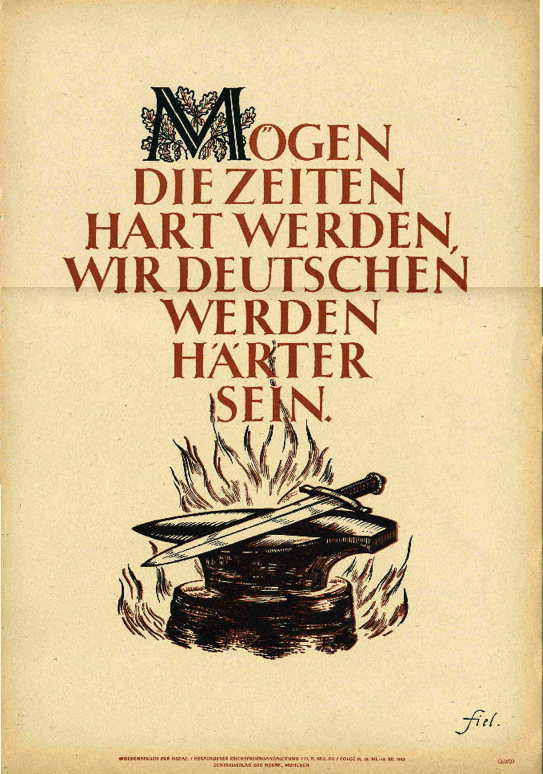 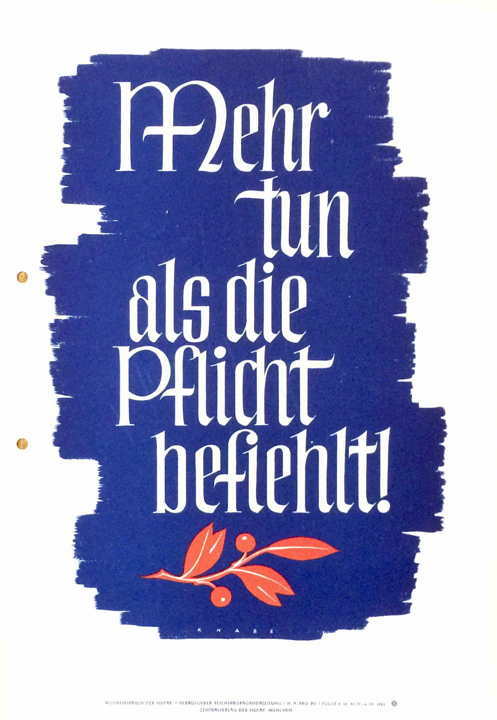 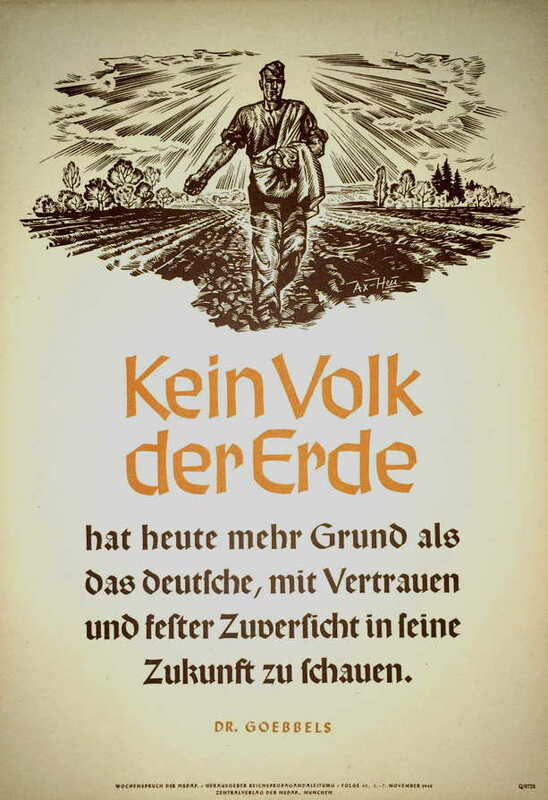 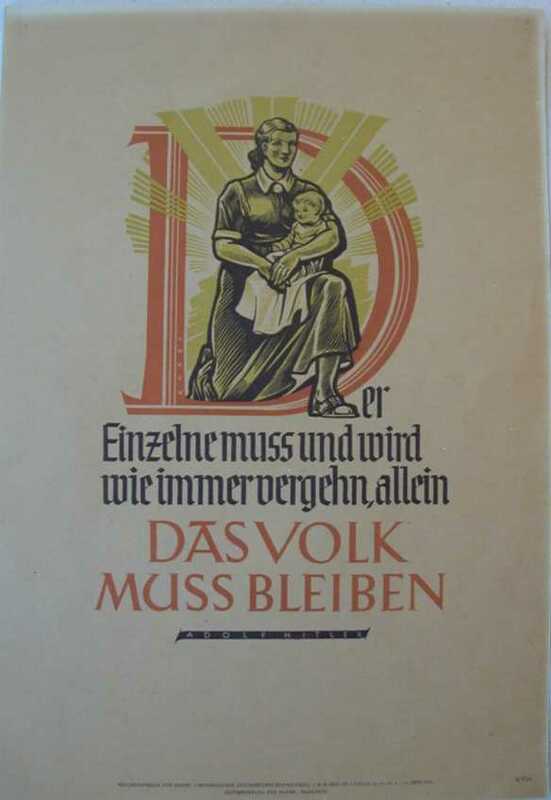 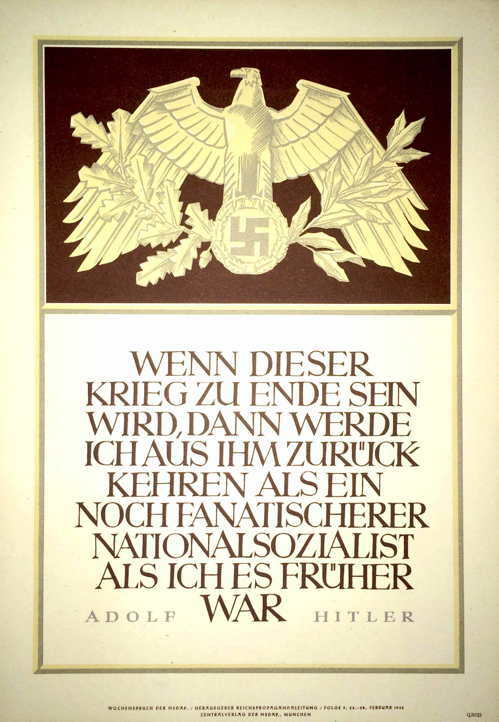 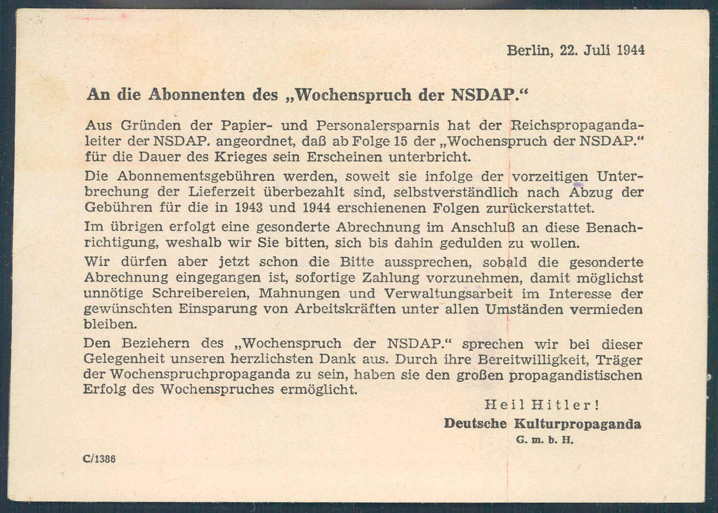 Background: The is a continuation of the Wochenspruch der NSDAP page for 1937-1941. 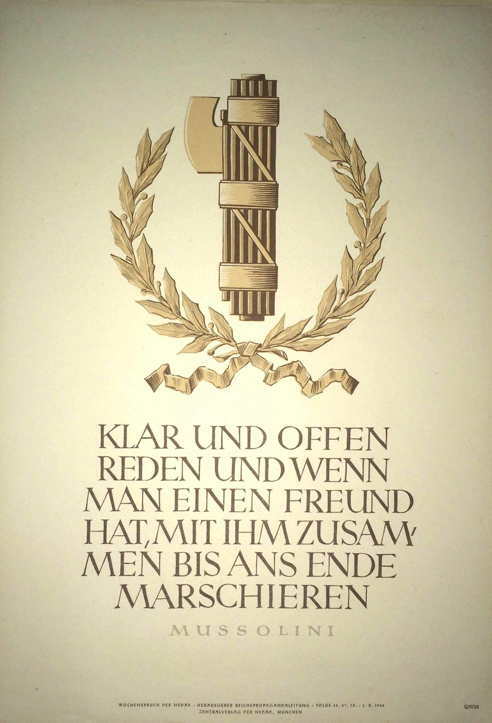 “Speak clearly and openly, and when one has a friend, march with him to the end. 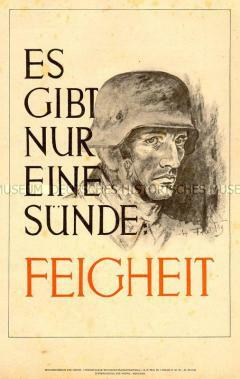 Mussolini.” (#40, 27 September - 3 October 1942) This one is interesting — it is the only one I have seen by a non-German. 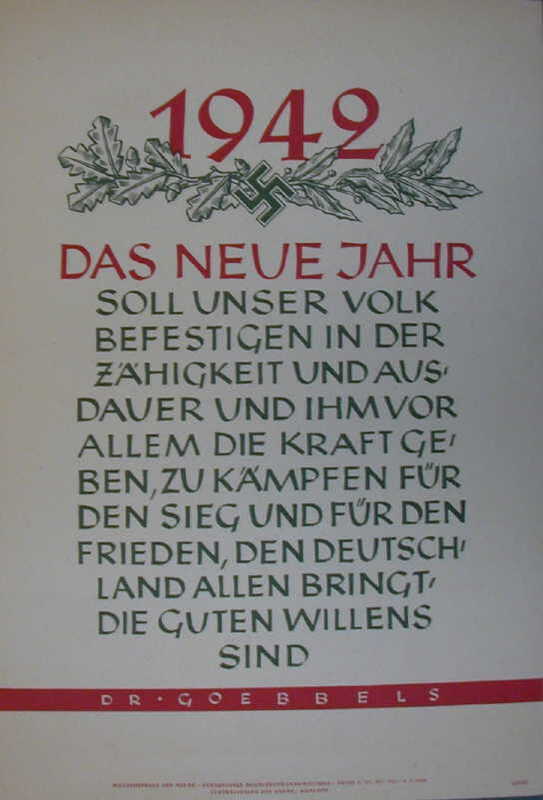 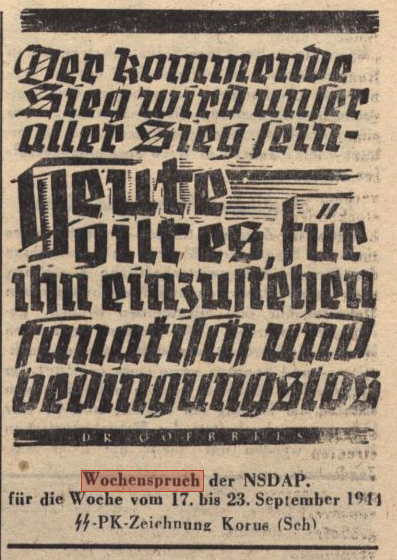 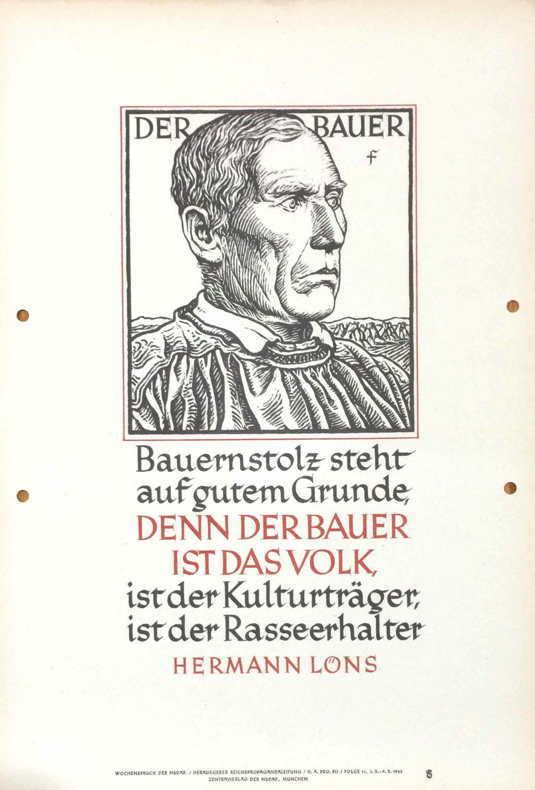 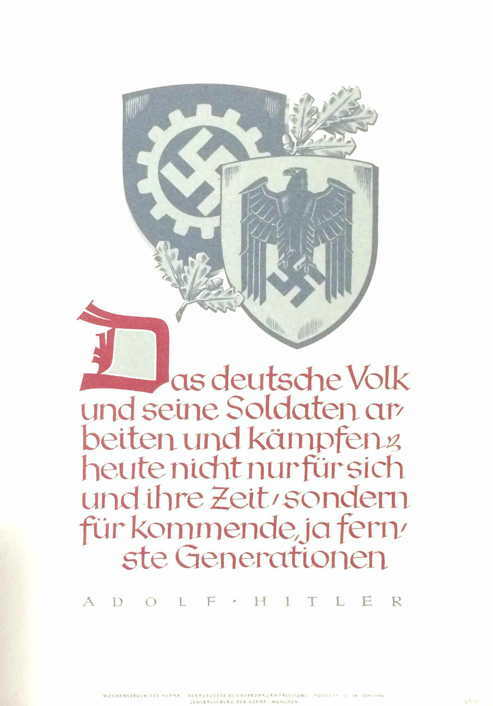 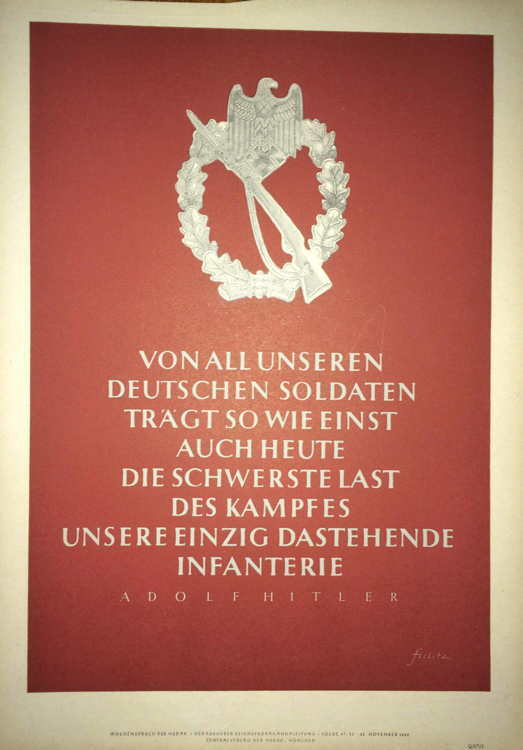 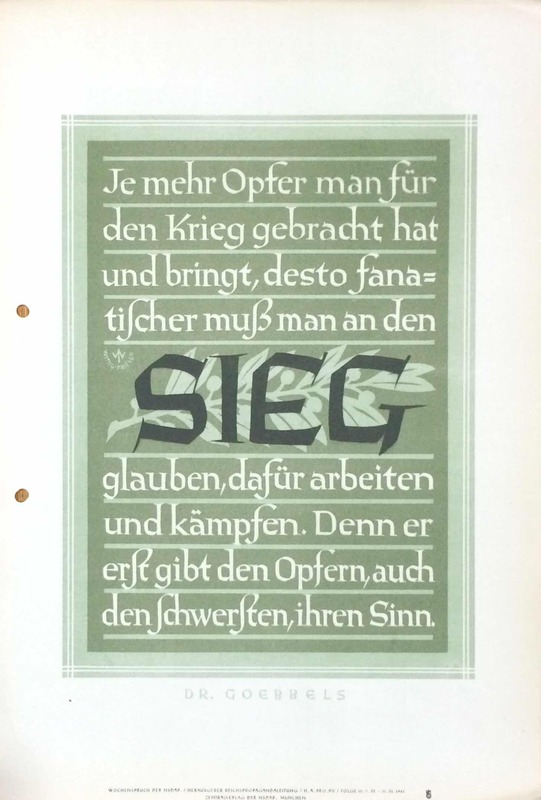 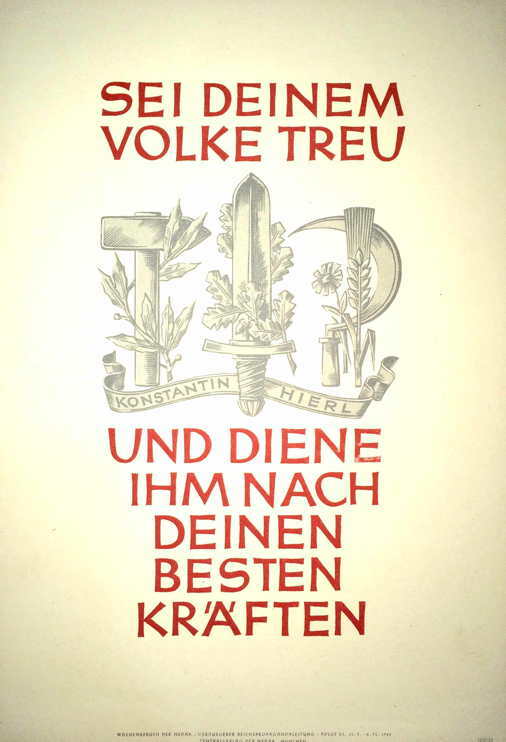 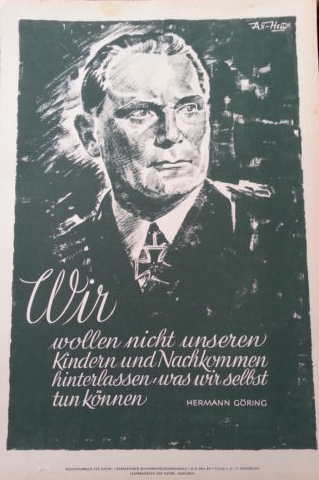 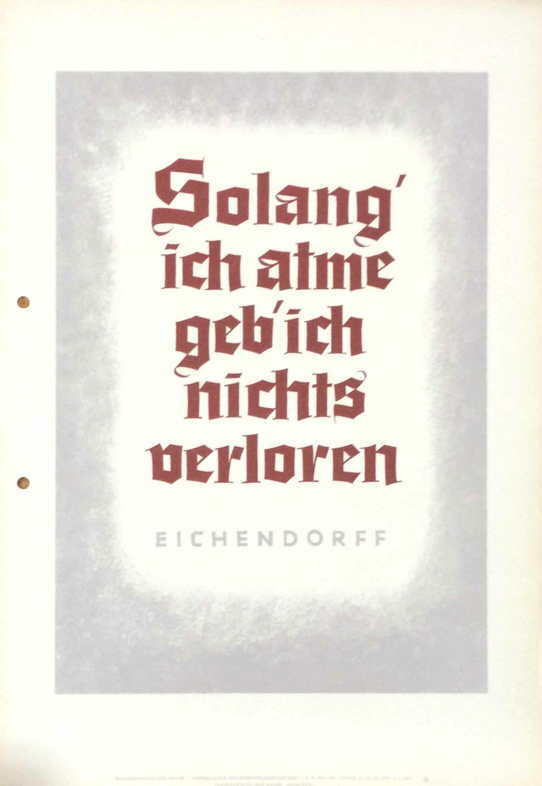 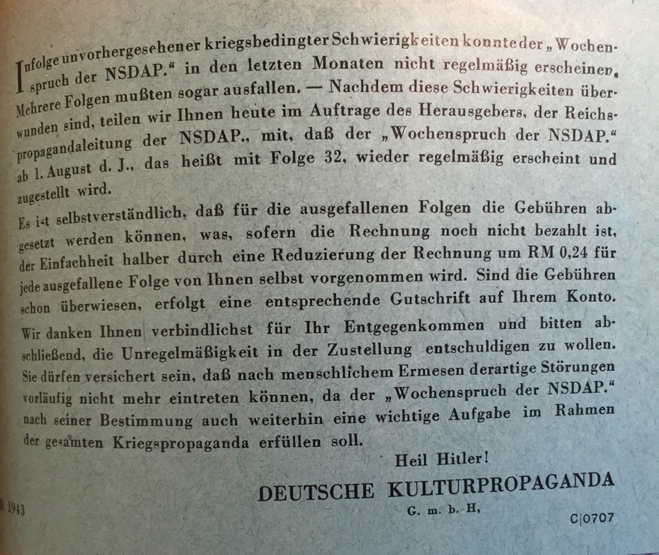 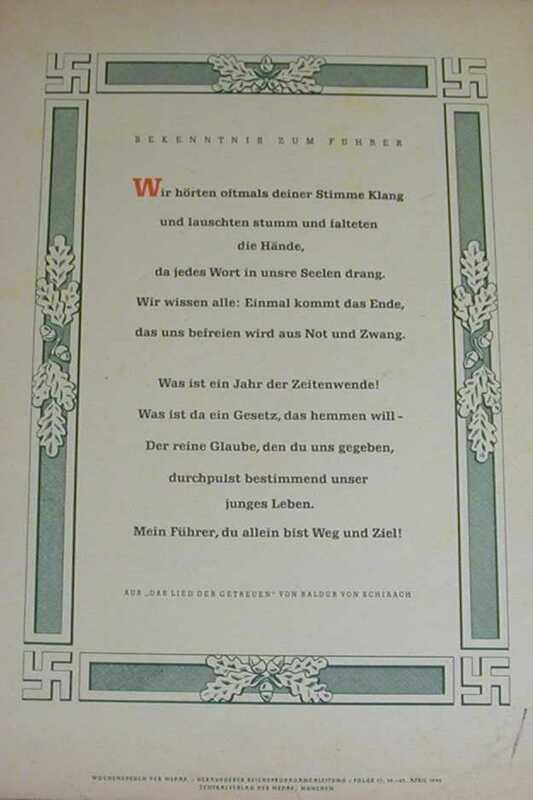 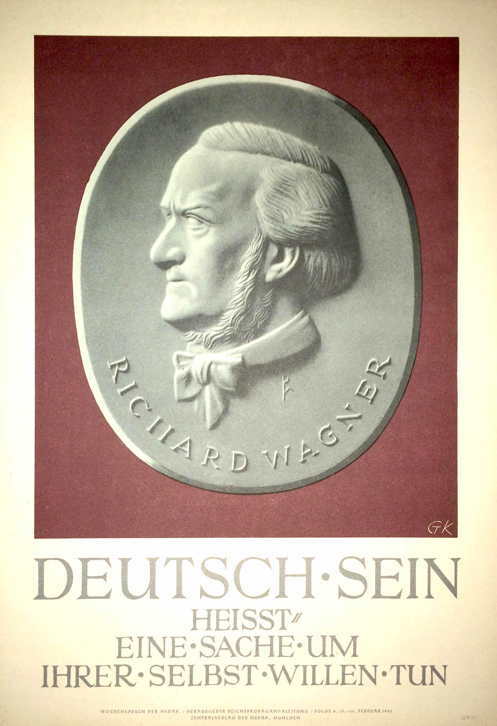 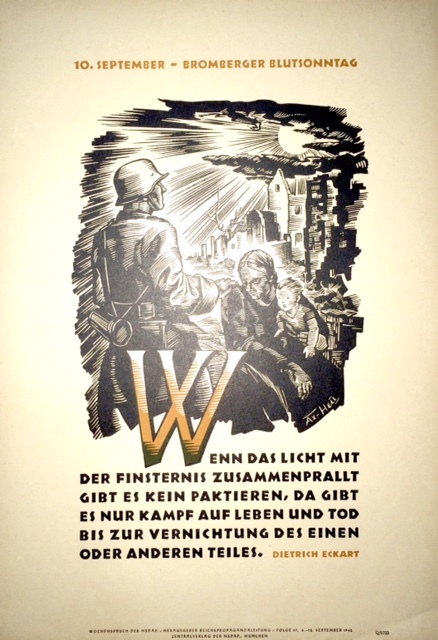 The Wochenspruch ceased publication with #15/1944 according to the note below (reprinted courtesy of MAR Historical). 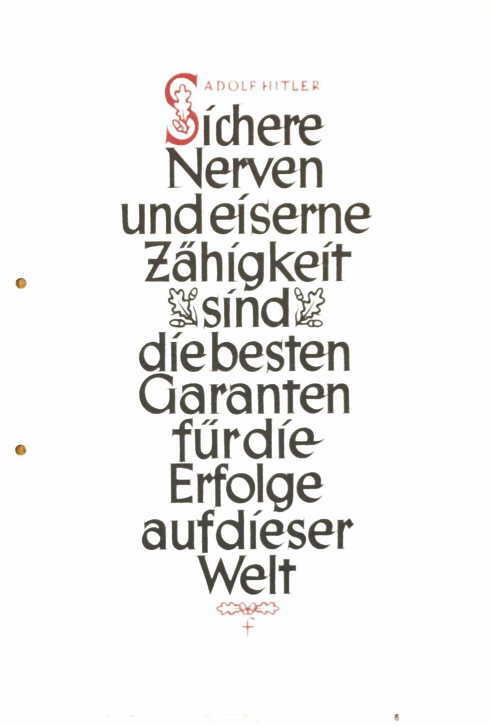 However, I have found later ones in newspapers. 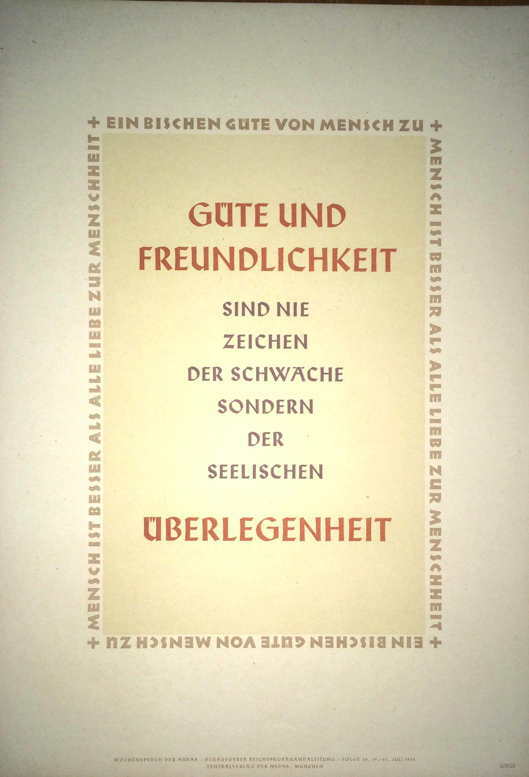 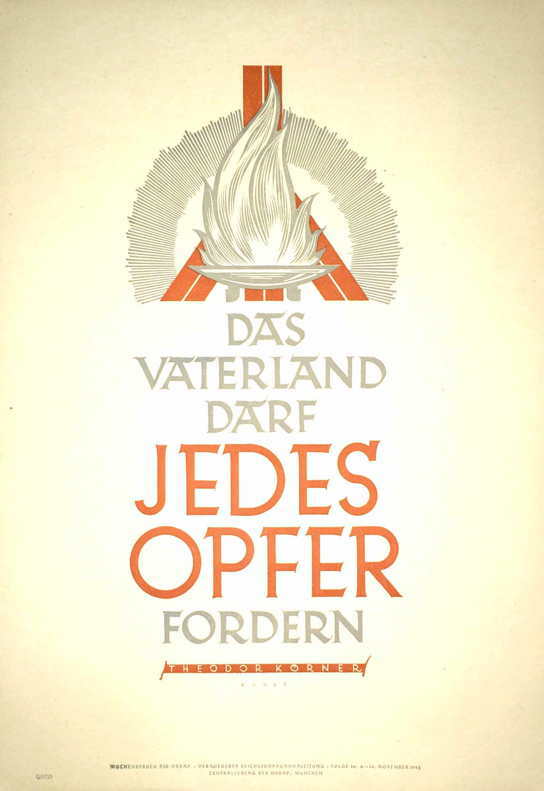 In most cases there are only texts, in one case an image. 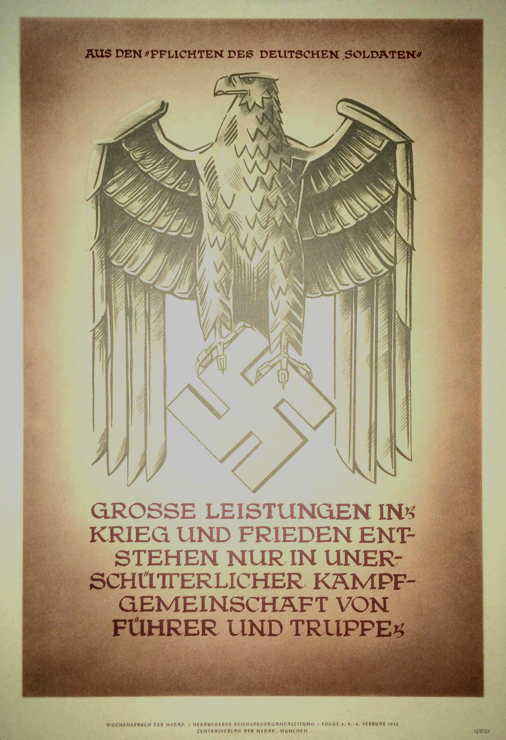 I am not sure if these were issued as posters or only printed in newspapers. 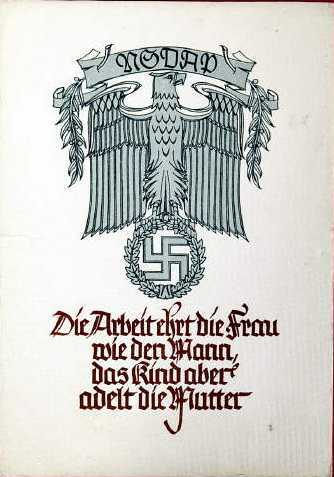 “One can never accomplish great things without courage and determination, for there is danger everywhere. 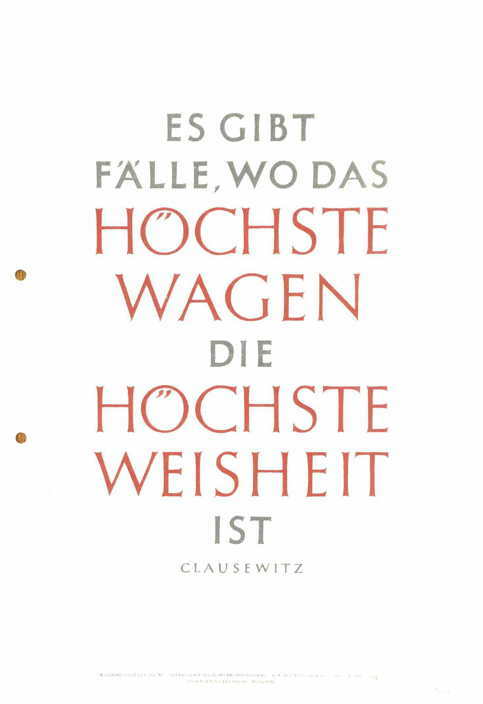 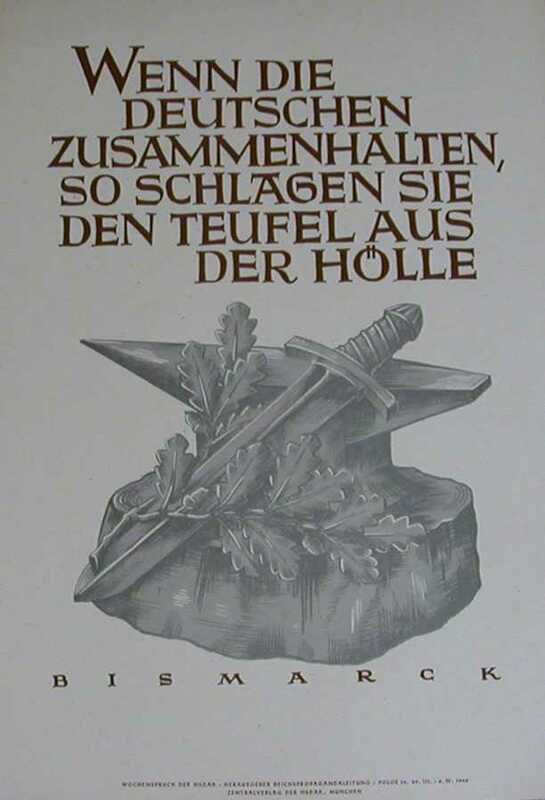 Clausewitz.” This is in a newspaper dated 12 June 1944.
â€œUnderstanding prepares an army for war, but the outcome is a matter of the heart. 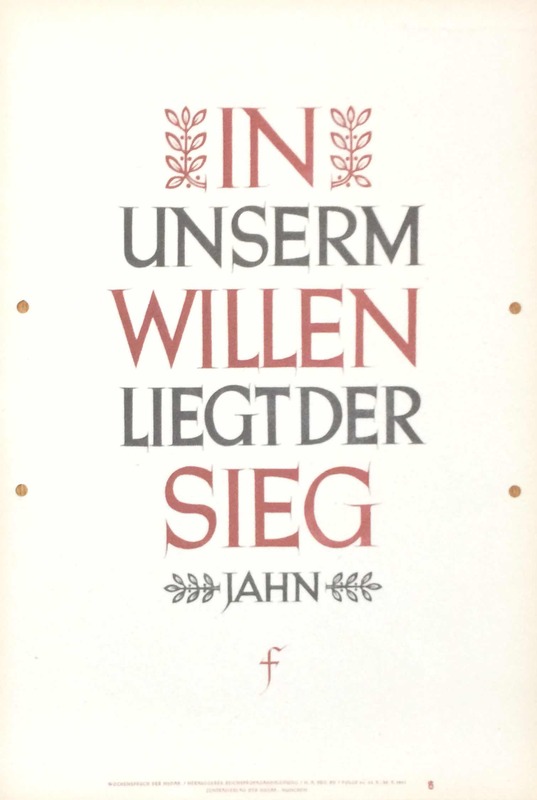 Jahn.â€� This is in a newspaper dated 24 June 1944. 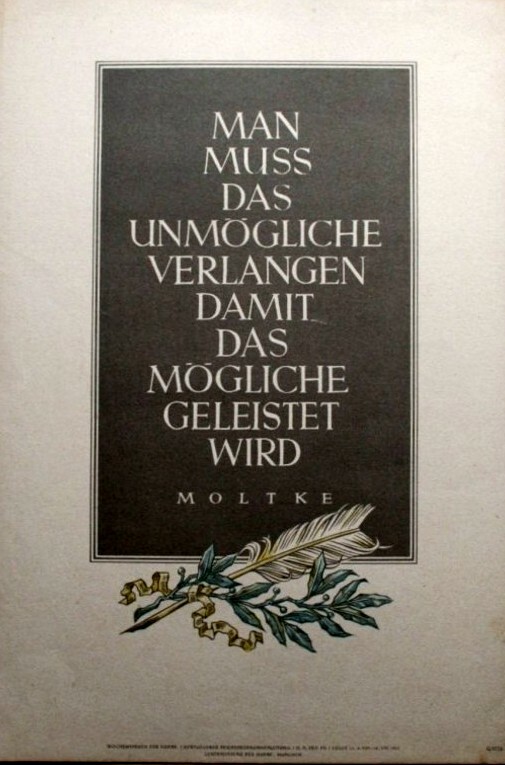 “A man is worthy of honor if he fully fills the post where he stands. 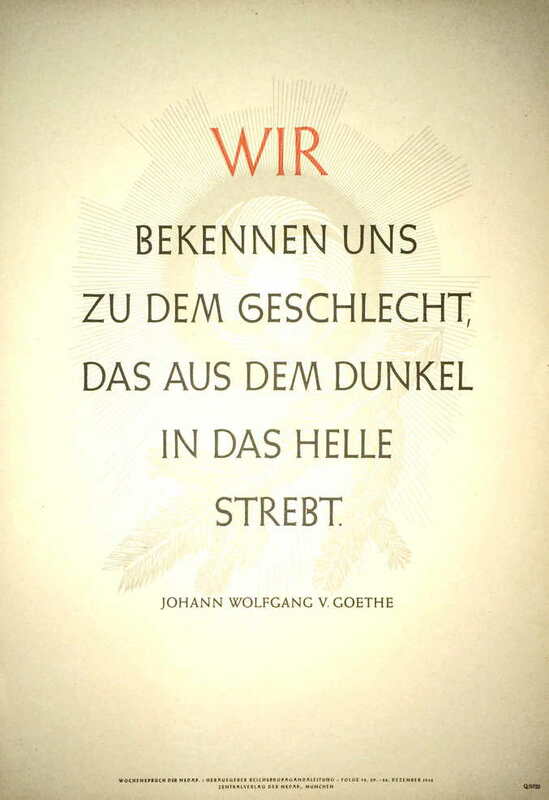 However small the impact, he is in his way great. 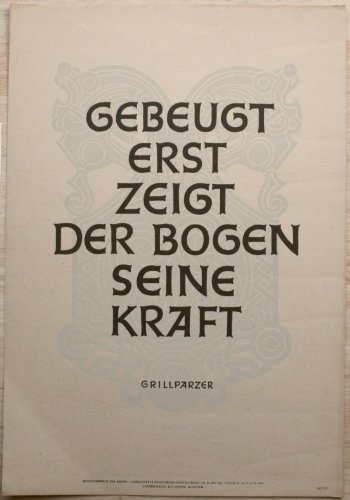 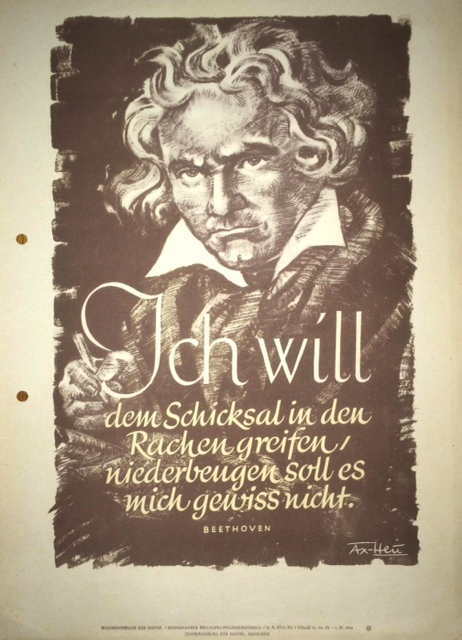 Schiller.” This is in a newpaper dated 25 June 1944.
â€œWho will doubt that the strength of our will can defeat the difficulties of the age. 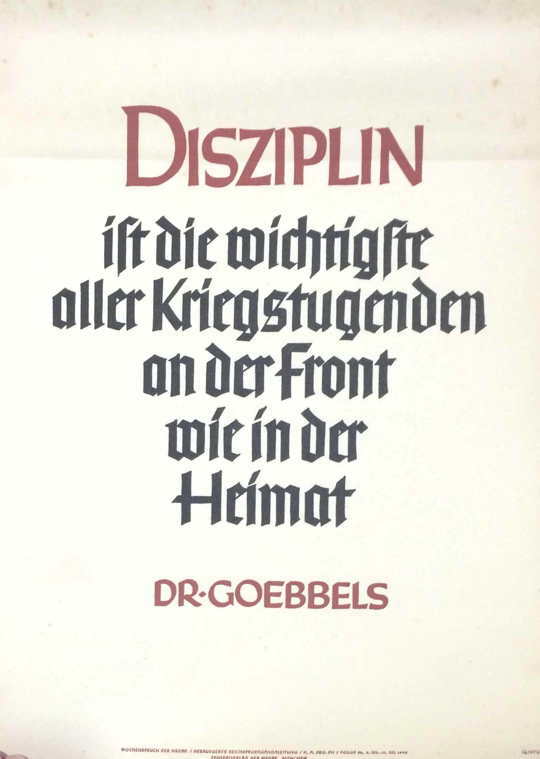 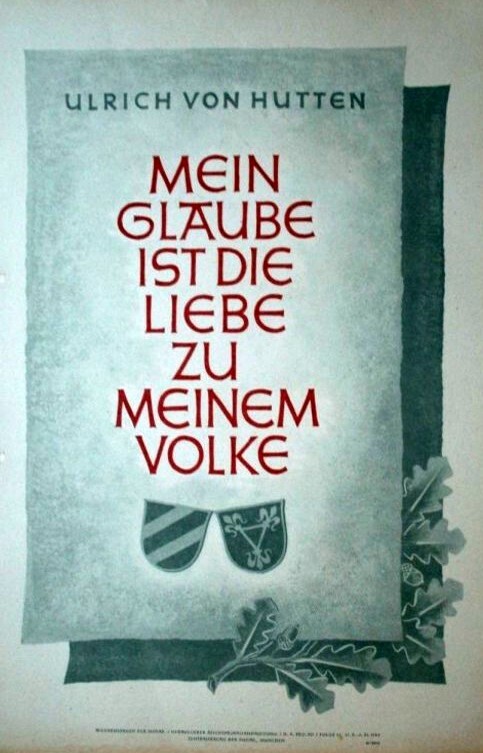 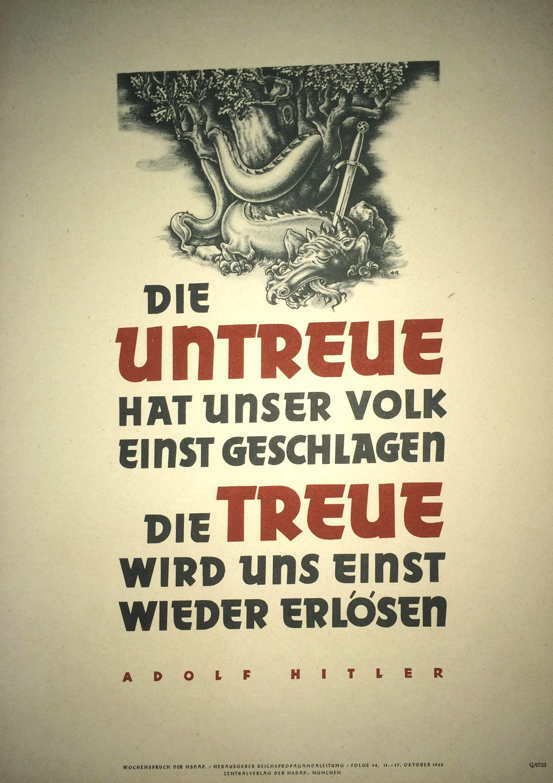 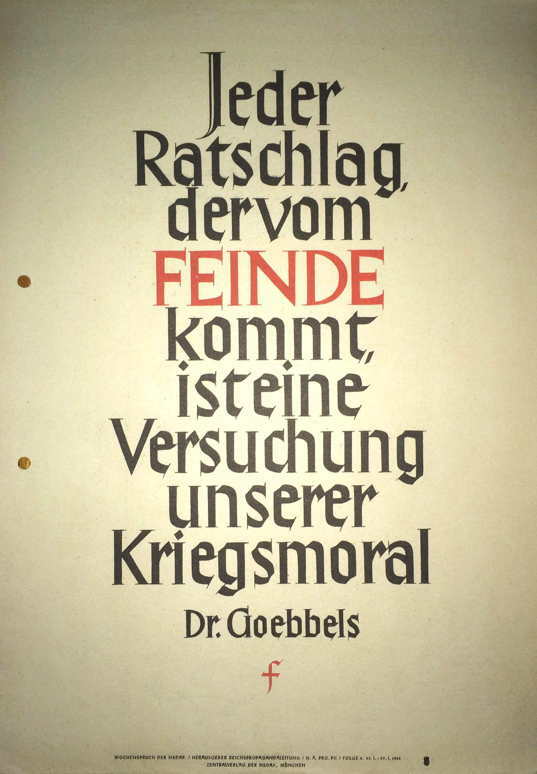 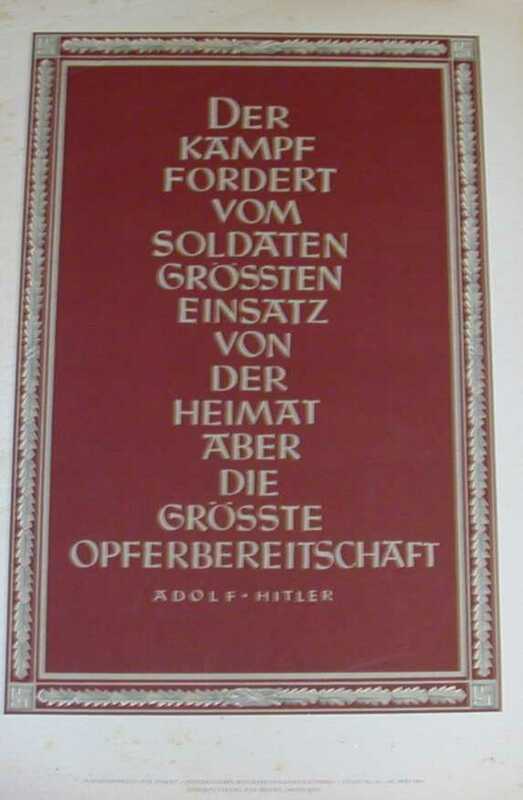 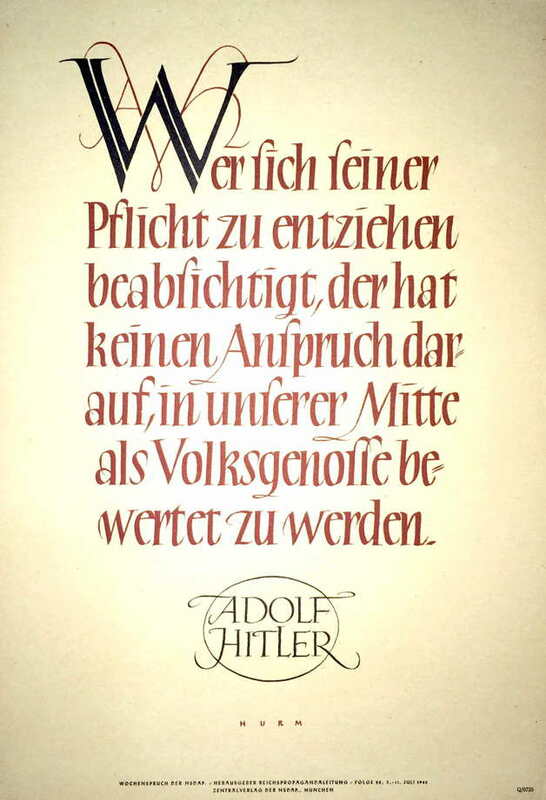 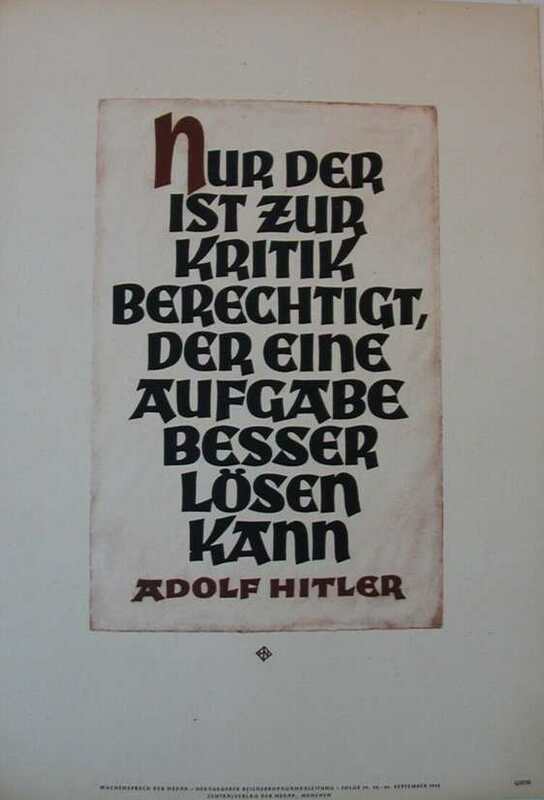 Dr. Goebbels.â€� This is in a newpaper dated 8 July 1944.
â€œHe who is unwilling to share privation and death with his people is not worthy to live among them. 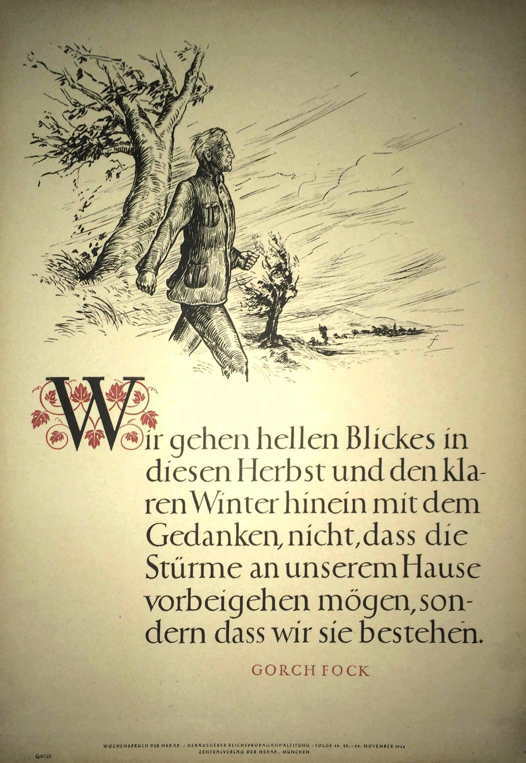 Stein.â€� This is in a newpaper dated 15 July 1944.
â€œOnly a strong generation will be able to maintain itself in the storms of our age. 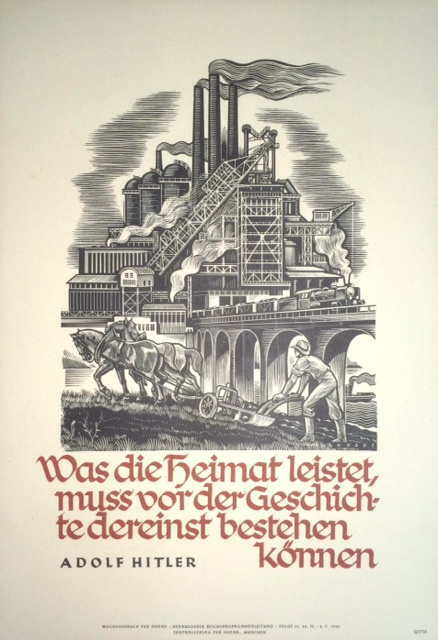 It needs guts of iron and a heart of steel. 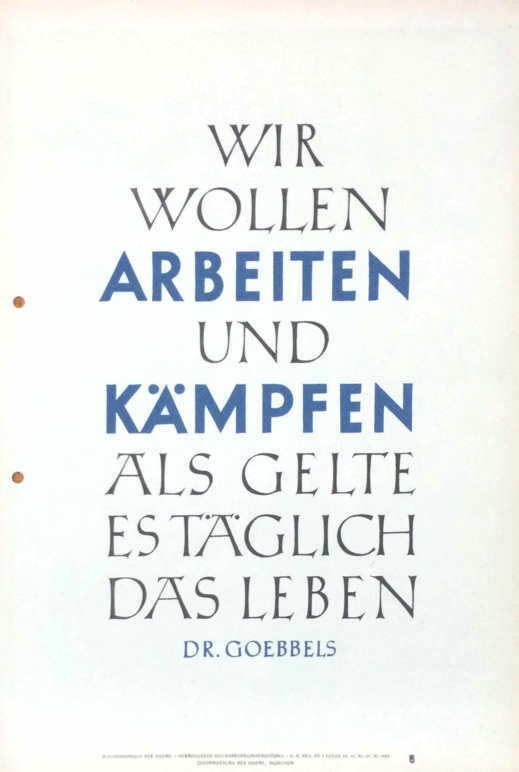 Dr. Goebbels.â€� This is in a newpaper dated 22 July 1944.
â€œNecessity knows one limit: when steadfastness and courage have become unlimited. 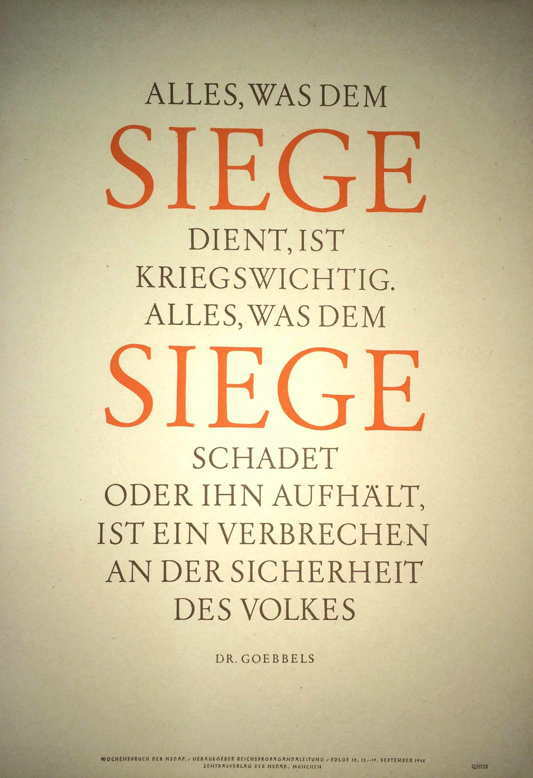 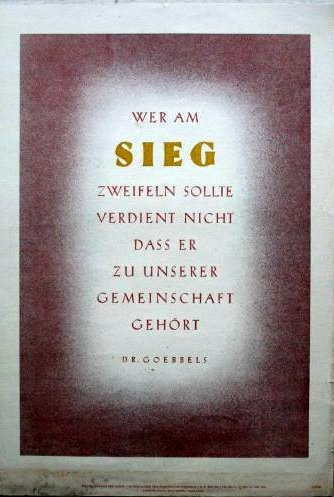 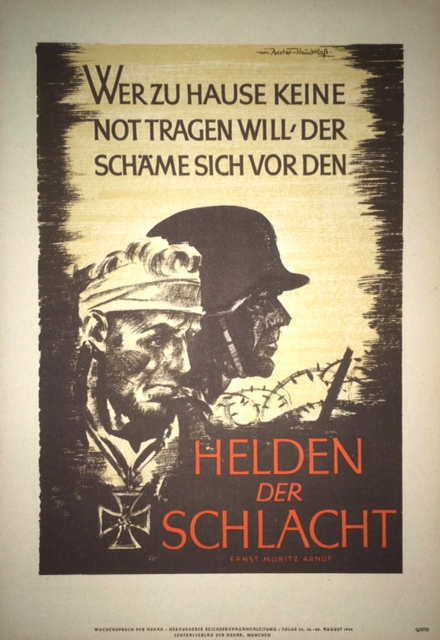 Dr. Goebbels.â€� This is in a newpaper dated 24 July 1944.
â€œBattle is everywhere, without battle there is no life. 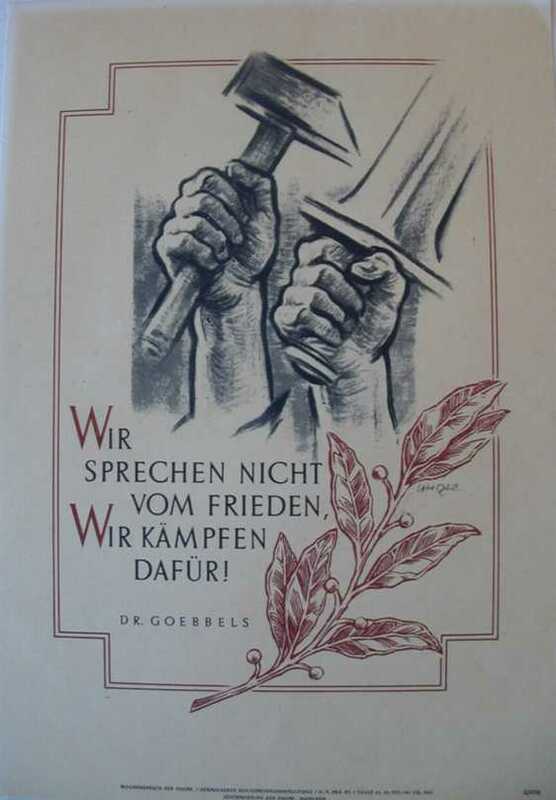 Since we want to live, we must also be ready to battle.â€� This is in a newpaper dated 30 July 1944.
â€œThe camaradarie of the youth is decisive for the future of the peopleâ€™s community. 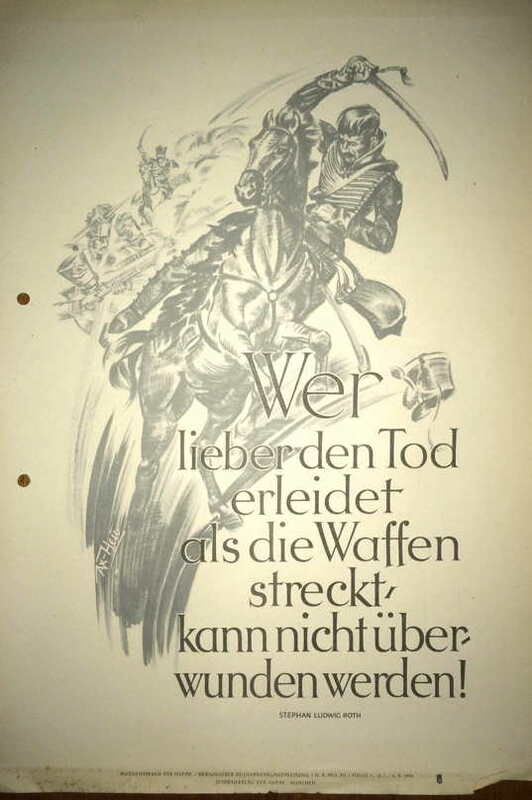 Rosenberg.â€� This is in a newspaper dated 6 August 1944.
â€œBattle is life â€” Life is battle! 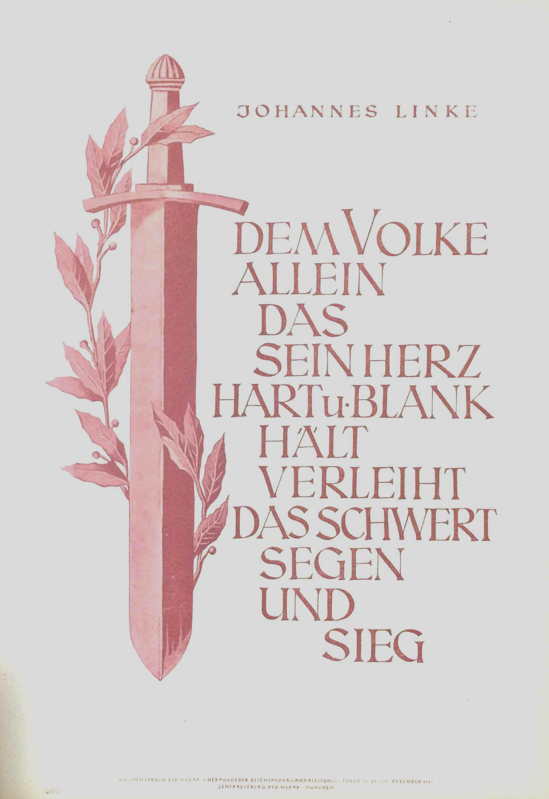 Only the cowardly and weak flee battle, but the strong seek it. 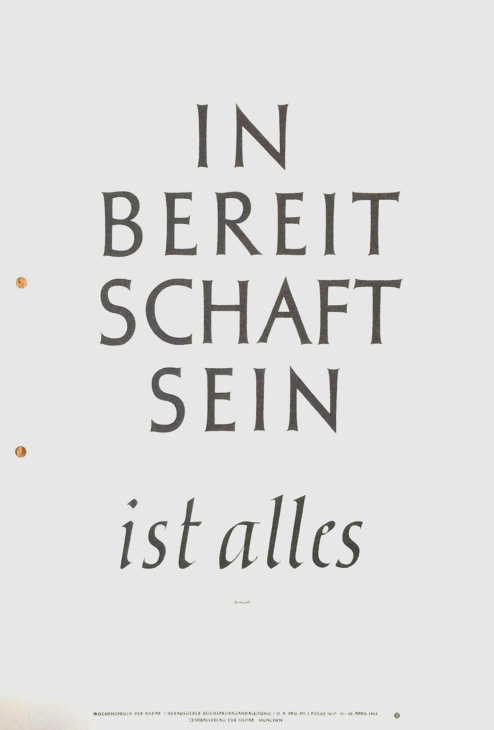 For them it is the meaning of life. 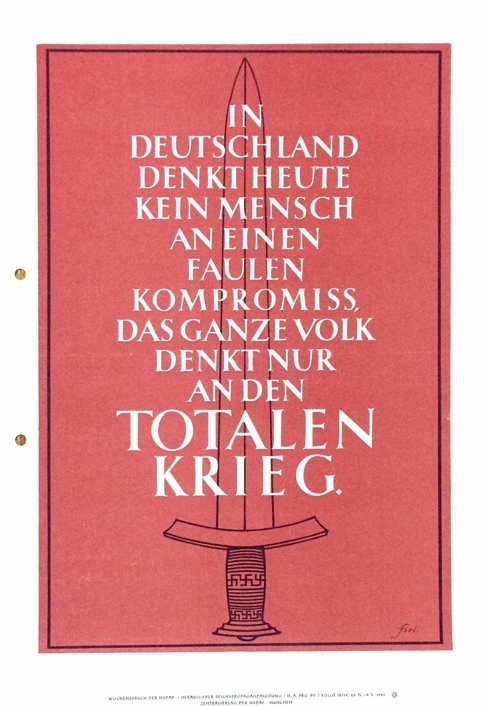 Bismarck.â€� This is in a newpaper dated 13 August 1944.
â€œGreat things can be accomplished only through daring. 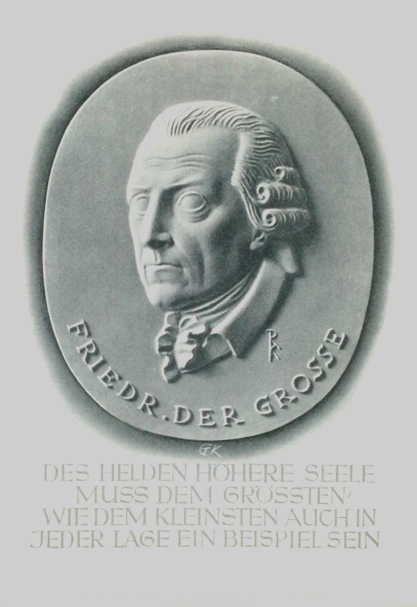 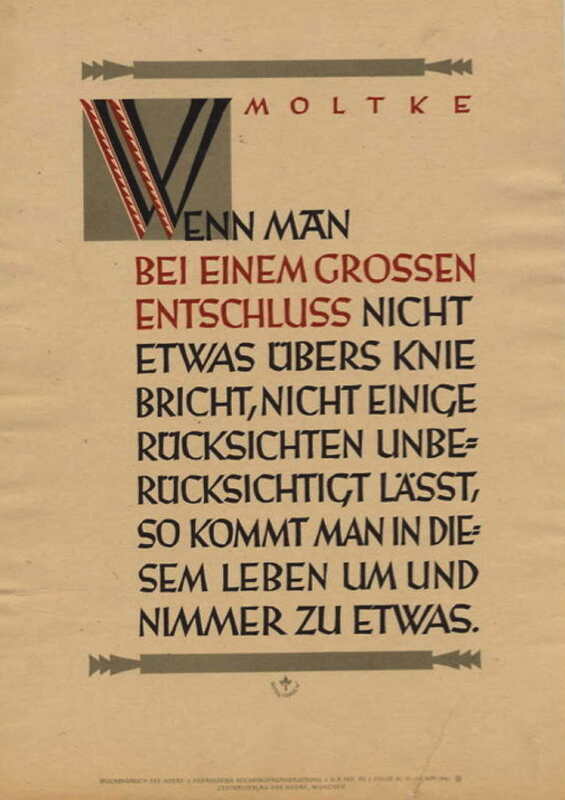 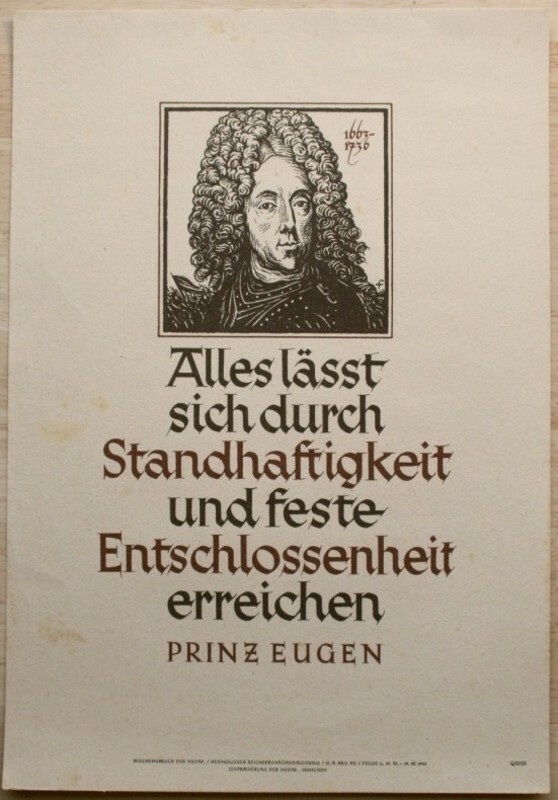 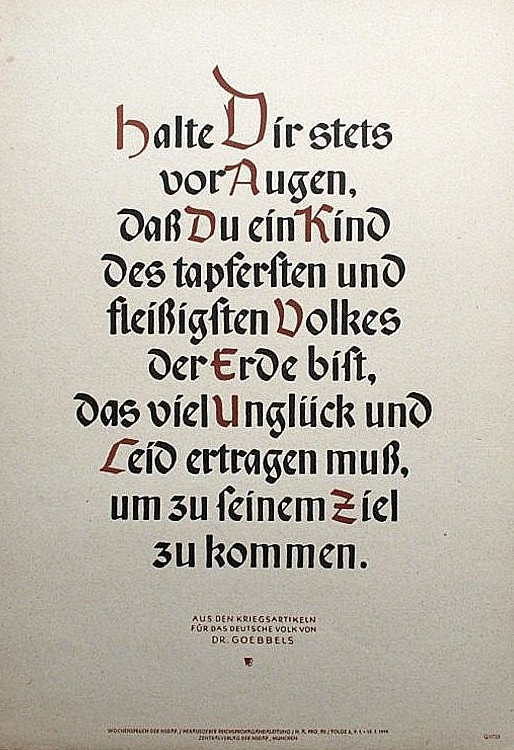 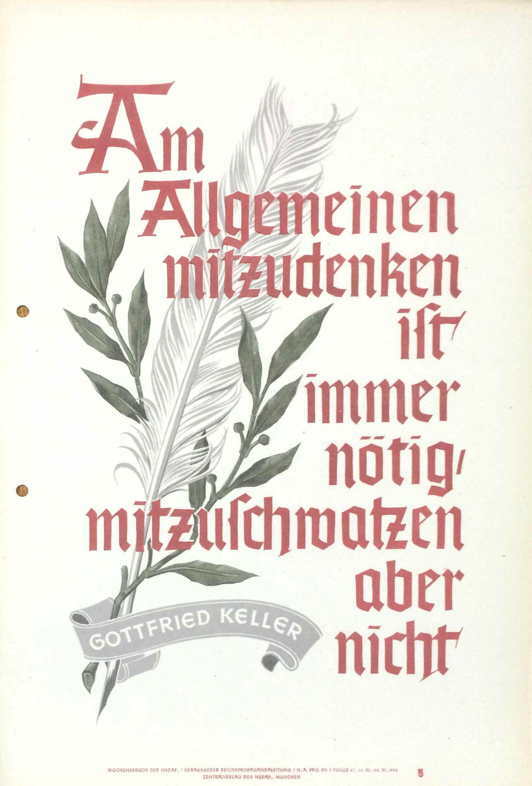 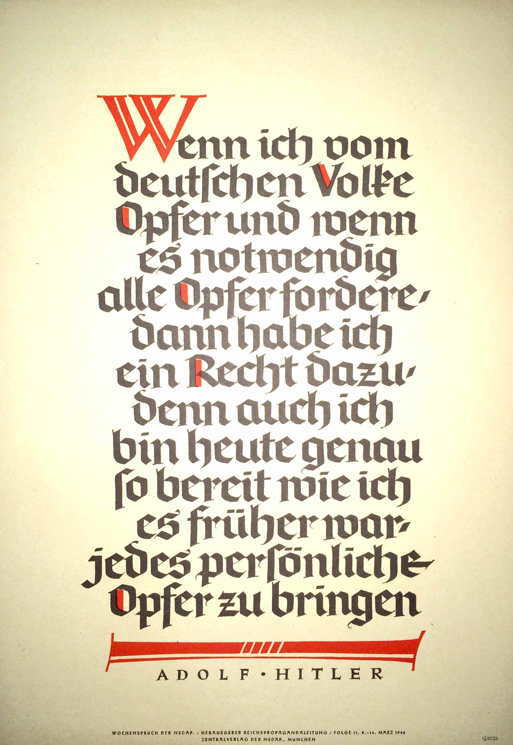 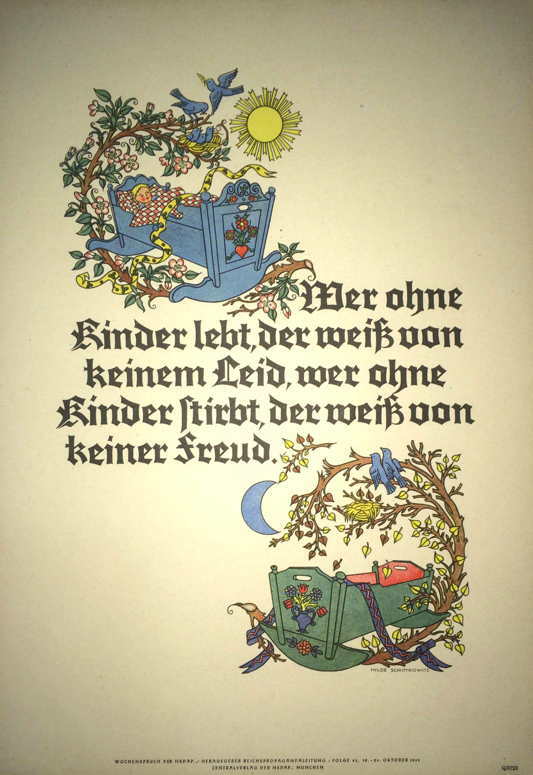 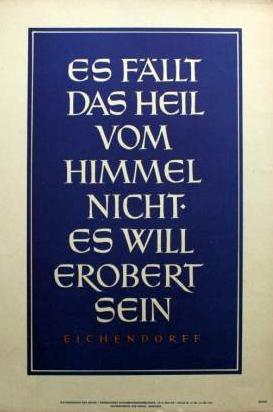 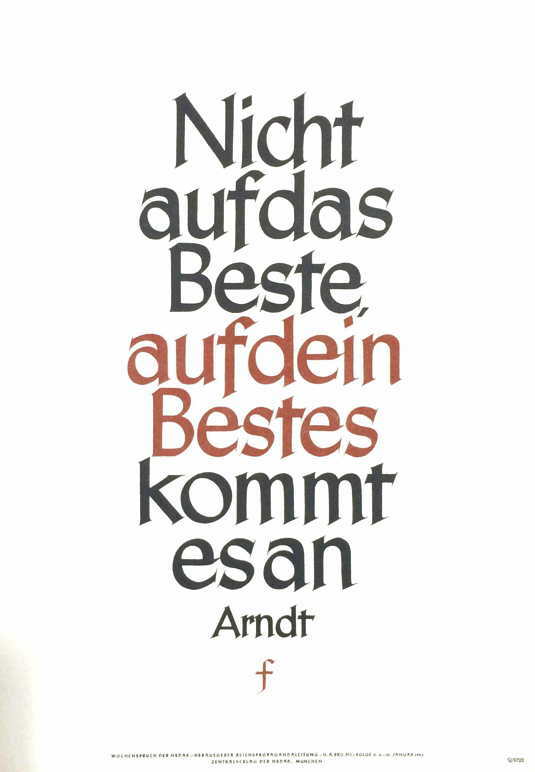 With this conviction and with firm determination to box the ears of everyone who stands in the way, one can spite hell and the Devil and be confident one has come through with honor.â€� Frederick the Great.â€� This is in a newpaper dated 26 August 1944.
â€œIt depends on all those who remain true to themselves! 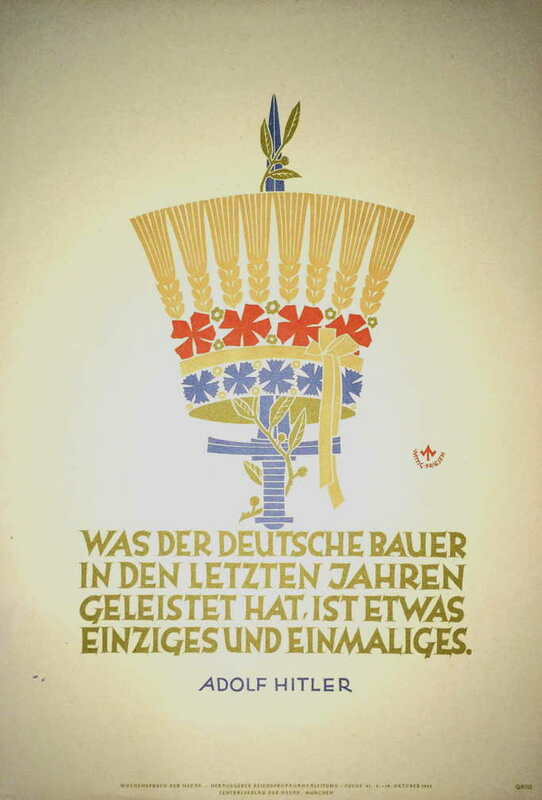 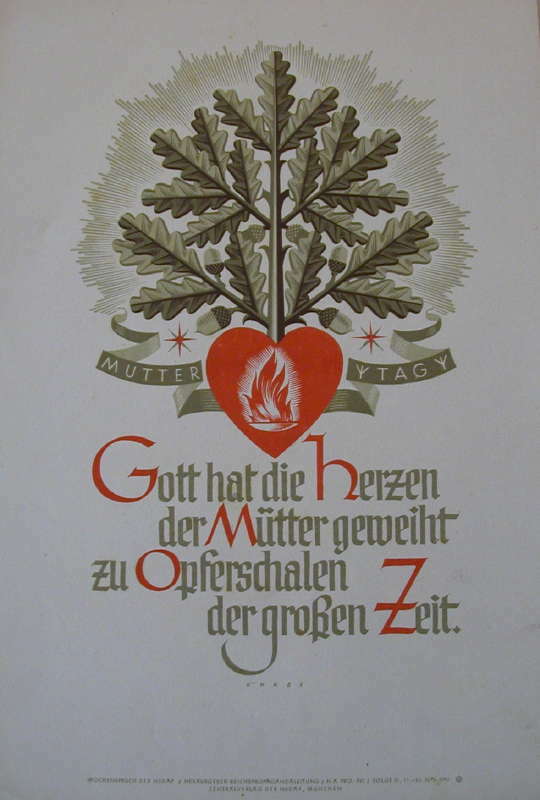 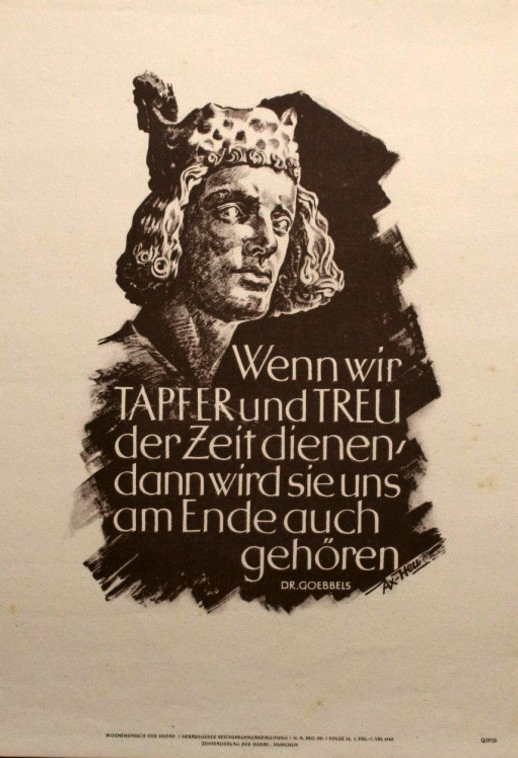 Goltz.â€� This is in a newpaper dated 27 August 1944.
â€œCrises and difficulties come and go. 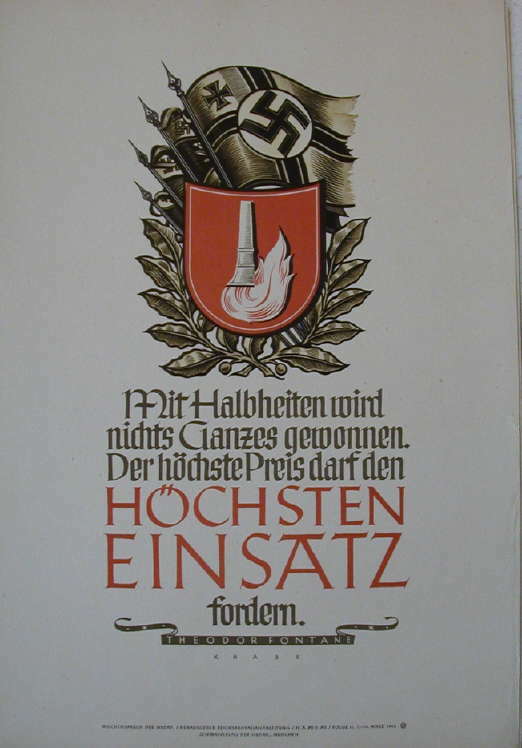 But the nation is eternal and must bravely and courageously take the path upwards! 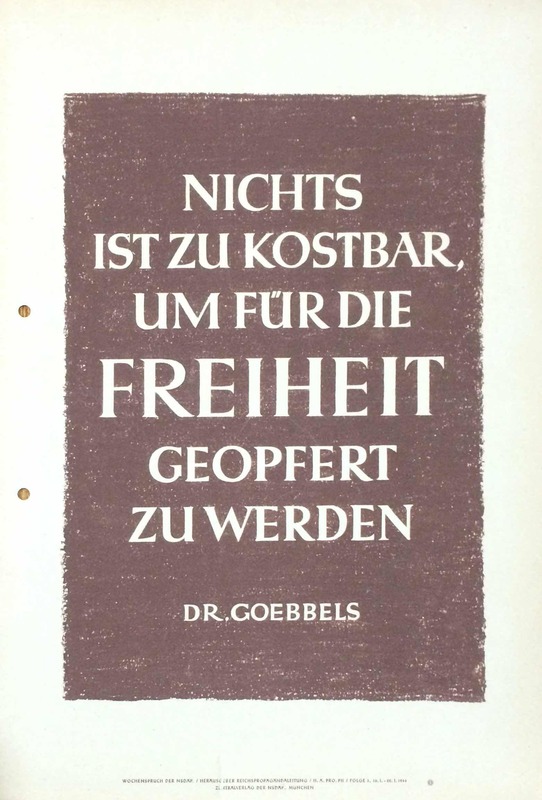 Dr. Goebbels.â€� This is in a newspaper dated 3 September 1944. 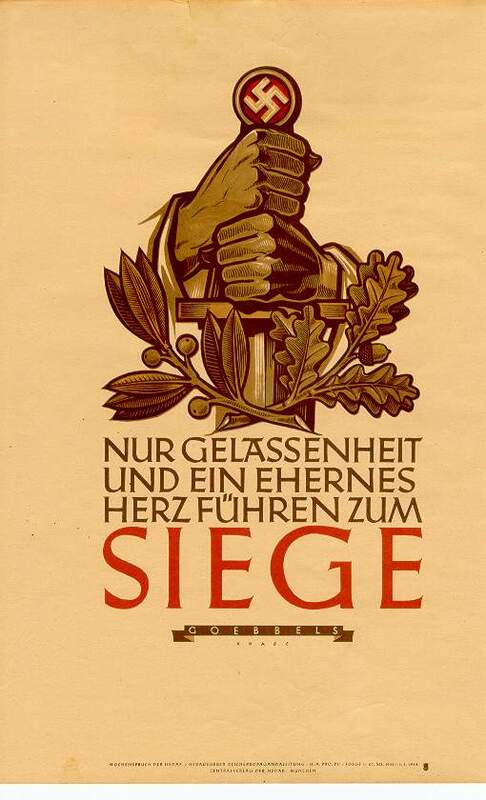 “The coming victory will be a victory for all of us. 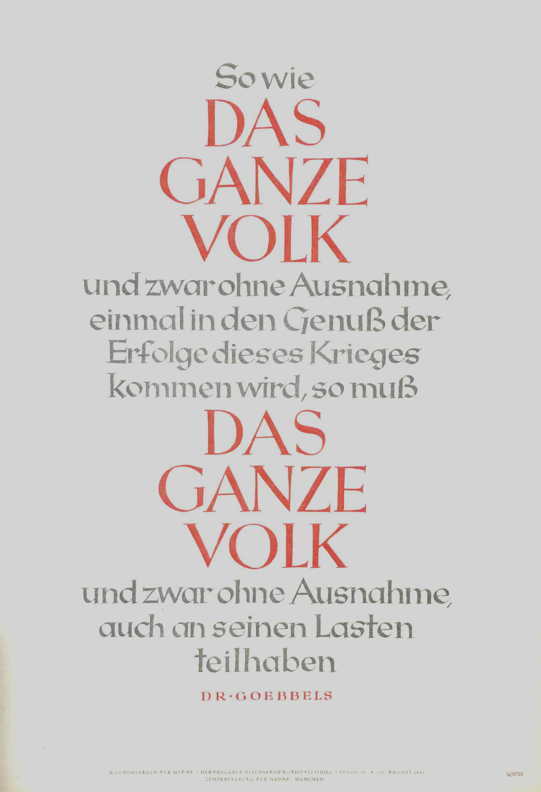 Today we must work fanatically and unconditionally to guarantee it. 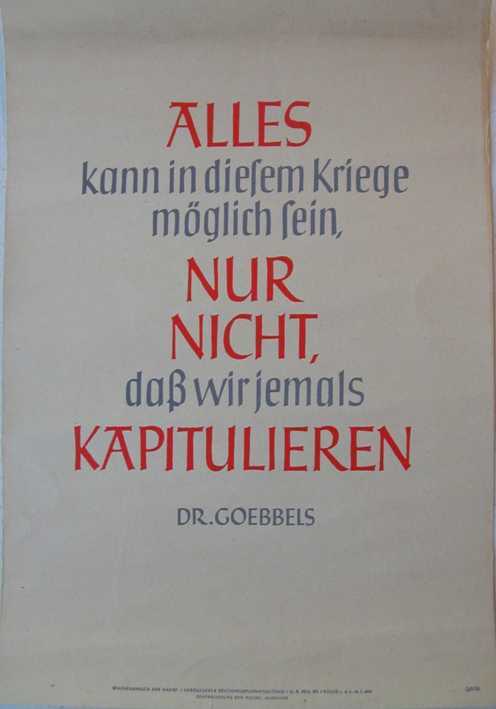 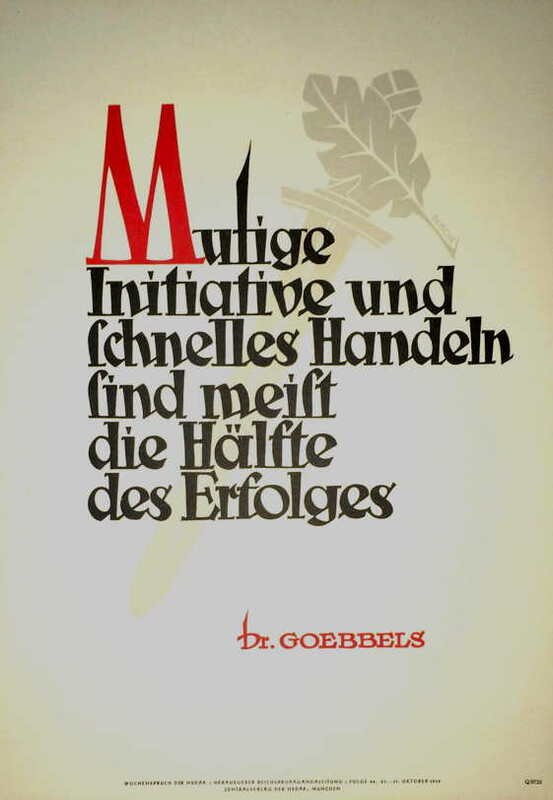 Dr. Goebbels.” (17 - 23 September 1944). 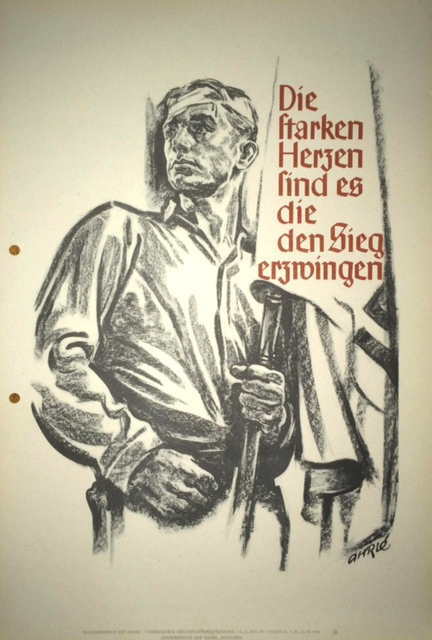 This is in a newspaper dated 20 September 1944.
â€œFor our people and fatherland, we hold no thought too elevated, no work too wearying, no conversation too trival, no burden too risky, and no sacrifice too great! 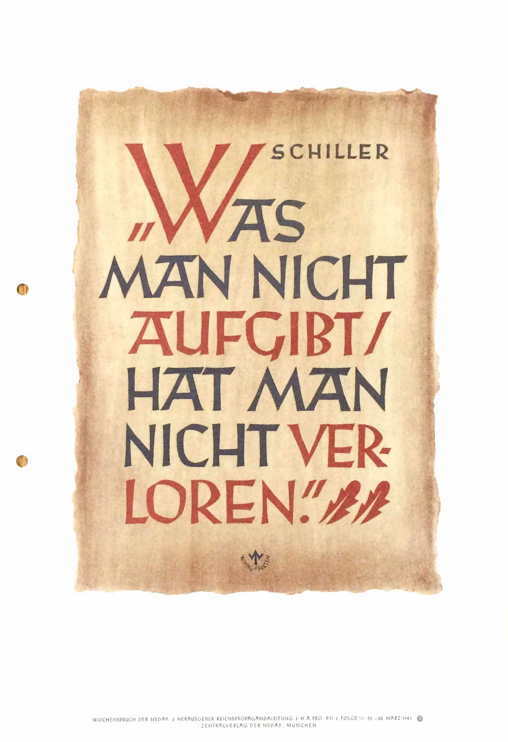 Friedrich Ludwig Jahn.â€� This is in a newspaper dated 7 November 1944. 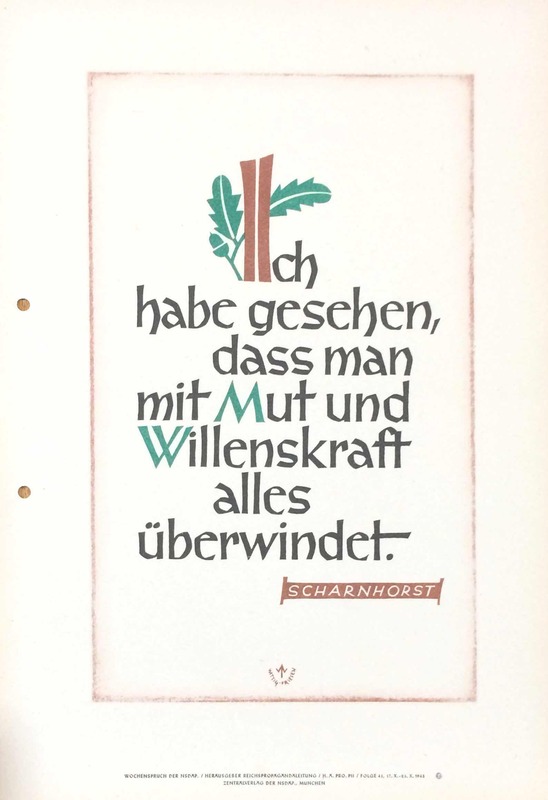 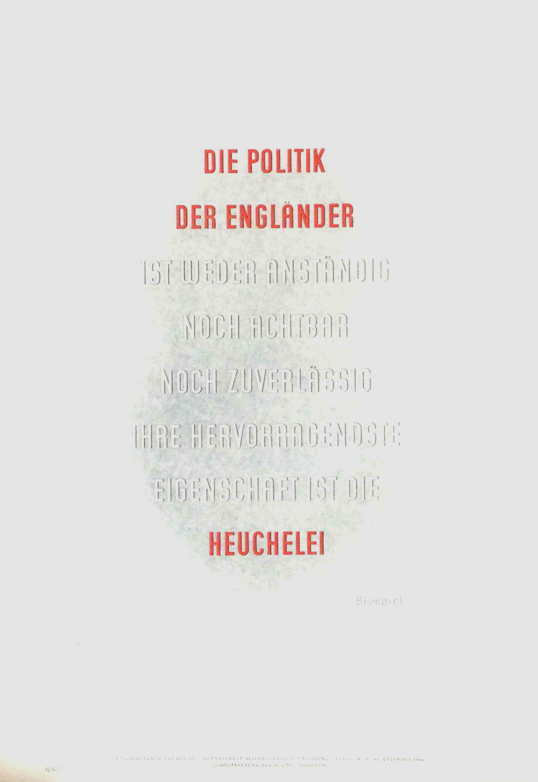 Go to the Wochenspruch index.